Organ renewal is governed by the dynamics of cell division, differentiation and loss. 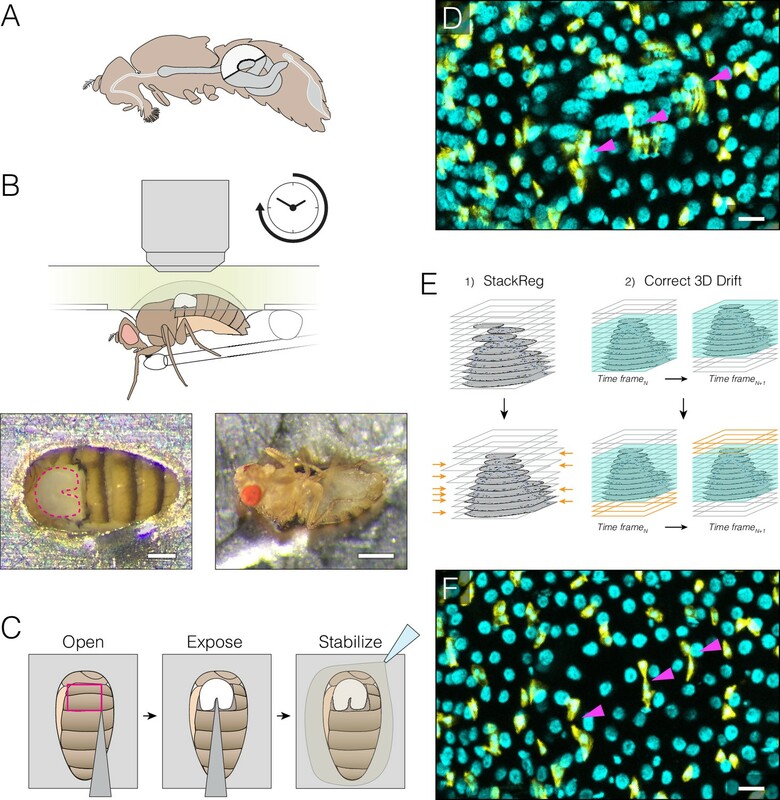 To study these dynamics in real time, we present a platform for extended live imaging of the adult Drosophila midgut, a premier genetic model for stem-cell-based organs. A window cut into a living animal allows the midgut to be imaged while intact and physiologically functioning. This approach prolongs imaging sessions to 12–16 hr and yields movies that document cell and tissue dynamics at vivid spatiotemporal resolution. 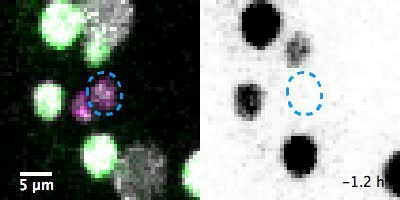 By applying a pipeline for movie processing and analysis, we uncover new and intriguing cell behaviors: that mitotic stem cells dynamically re-orient, that daughter cells use slow kinetics of Notch activation to reach a fate-specifying threshold, and that enterocytes extrude via ratcheted constriction of a junctional ring. By enabling real-time study of midgut phenomena that were previously inaccessible, our platform opens a new realm for dynamic understanding of adult organ renewal. Stem-cell-based organs rely upon the coordinated control of cell division, differentiation and loss to maintain tissue homeostasis. Studies of the Drosophila adult midgut (Figure 1A) have elucidated conserved processes and pathways that control these events during healthy turnover and cause their dysfunction during aging and in cancer. These contributions, which include descriptions of the mechanisms of multipotency and asymmetric-symmetric fates, endocrine and immune regulation, and injury and stress responses, span the range of adult stem cell biology (Biteau et al., 2008; Buchon et al., 2009; Deng et al., 2015; Guo and Ohlstein, 2015; Hudry et al., 2016; Jiang et al., 2009; O'Brien et al., 2011; Ohlstein and Spradling, 2007; Siudeja et al., 2015). Extended imaging of the midgut in live Drosophila adults. (A) Adult female midgut in situ, sagittal view. The white highlighted area indicates region R4a-b, also known as P1-2, (Buchon et al., 2013a; Marianes and Spradling, 2013)) of the midgut that will be exposed for imaging. (B–C) The midgut is accessed through a small cuticular window cut in the back of a live animal. (B) (Top) Schematic of the imaging apparatus. The animal is affixed to a modified petri dish ‘mount’. The chamber of the mount contains media. The underside of the mount supports a feeder tube. See and Fig. 1-fig. supplement 2. (Bottom) Dorsal (left) and ventral (right) views of an animal in the mount. In the left panel, the exposed midgut is outlined by the magenta dotted line. Scale bars: 0.25 mm (left), 0.5 mm (right). See Video 4. (C), Steps in preparing the midgut for imaging. See Video 1 tutorial. (D–F) Registration macros are applied post-acquisition to correct the blurring caused by tissue movements. (D), Before registration, blurring and duplications (arrowheads) are evident. This panel is a raw z-series projection of one movie time point. (E), During registration, two ImageJ plugins are applied in series. (1) 'StackReg' corrects for tissue movement during z-stack acquisition at a single time point. (2) 'Correct 3D Drift' corrects for global volume movements over multiple time points. (F), After registration, blurring and duplications are negligible. Cyan, all nuclei (ubi-his2av::mRFP); yellow, stem cells and enteroblasts (esg >LifeactGFP). Scale bars, 20 μm. See Video 6. Nevertheless, investigation of midgut cell dynamics has been constrained by the lack of a viable platform for extended live imaging. At present, fixed midguts provide static snapshots of cells and tissues but do not allow dynamic behaviors to be observed over time. Meanwhile, cultured midguts have been imaged ex vivo for 60–90 min—a time window long enough to allow studies of faster events such as calcium oscillations, cell divisions and acute toxicity responses (Antonello et al., 2015; Deng et al., 2015; Lee et al., 2016; Montagne and Gonzalez-Gaitan, 2014; Scopelliti et al., 2014), but too short for observations of slower events such as differentiation and apoptosis. Indeed, the power of extended live imaging is demonstrated by studies of numerous other stem-cell-based organs, including Drosophila ovary and testis (Fichelson et al., 2009; Lenhart and DiNardo, 2015; Morris and Spradling, 2011) and mouse epidermis, testis, muscle and intestine (Bruens et al., 2017; Gurevich et al., 2016; Hara et al., 2014; Ritsma et al., 2014; Rompolas et al., 2012Rompolas et al., 2016; Webster et al., 2016). For the midgut, long-term live imaging would synergize with the organ’s existing genetic tractability and well-characterized cell lineages to open exciting investigative possibilities. To enable such studies, we present a simple platform that substantially extends imaging times by keeping the midgut within a living animal. The live animal is secured in a petri dish, and the midgut is visualized through a window cut into the dorsal cuticle. The organ’s structural integrity stays largely intact, which allows routine acquisition of movies of ~12–16 hr in duration. Furthermore, digestive function is preserved; the animals ingest food, undergo peristalsis, and defecate even while being imaged. As a result, these long-term movies vividly capture midgut cell dynamics in a near-native physiological context. To allow mining of the data in these movies, we also present a systematic approach for image processing and segmentation and for the spatiotemporal analysis of single cells and whole populations. These proof-of-principle analyses both corroborate prior fixed-gut observations and reveal intriguing, dynamic behaviors that relate to cell division, differentiation and loss. (1) For division, we find that mitotic stem cells frequently re-orient—sometimes repeatedly—but can be ‘anchored’ in place by two immature enteroblast cells. (2) For differentiation, we analyze the kinetics of Notch activation, which reveal the transition from a stem-like to a terminal cell state, and we find that, contrary to expectation, real-time activation does not correlate with contact between Notch- and Delta-expressing siblings. (3) For cell loss, we perform morphometric analysis of enterocyte cell extrusion over time and find that extrusion occurs via ratcheted constriction of a basal junctional ring. These analyses demonstrate the power of examining midgut cell dynamics in a near-native context over multi-hour timescales. By allowing real-time observation of cellular events that were previously inaccessible, our platform holds promise to advance our understanding of the fundamental cell behaviors that underlie organ renewal. We designed a ‘fly mount’ for imaging the midgut in live Drosophila adults (Figure 1B). Our mount, similar to an apparatus for imaging adult Drosophila brains (Seelig et al., 2010), is assembled from inexpensive, common materials and can be configured for upright, inverted or light-sheet microscopes (Figure 1—figure supplement 1A–D). In the mount, a live animal is stabilized by affixing its abdomen in a cutout within a petri dish (for upright or inverted microscopes) or a syringe barrel (for light-sheet microscopes) (Figure 1—figure supplement 1A–D, Figure 1—figure supplement 2, Video 1). The midgut’s R4a-b (P1-2) region (Buchon et al., 2013a; Marianes and Spradling, 2013) is exposed through a window that is cut in the dorsal cuticle (Figure 1B–C, Video 1). This arrangement leaves the midgut-associated trachea and neurons largely intact (Video 2). Steps to assemble the fly mount and prepare the midgut are illustrated in a detailed tutorial (Video 1). Narrated, step-by-step tutorial illustrating the preparation of an animal for midgut imaging in the fly mount. Movie showing the association of the trachea (cyan) with the midgut tube (red). Smaller tracheal branches encircle the tube and move in concert with peristaltic contractions. A large tracheal branch (upper right) is continuous with smaller branches. The large branch does not move during peristalsis because it is not physically associated with the midgut; instead, it connects the midgut-associated branches to a spiracle (not visible in the movie frame). Left video: cyan pseudocolor, trachea (breathlessGal4, UAScyt-GFP); red pseudocolor, microtubules (SiR-tubulin). Right video: inverted gray, breathlessGal4, UAScyt-GFP. Each time point is the projection of a confocal z-stack. Scale bar, 20 µm. Three design features prolong animal viability. First, the animal is provided liquid nutrition through a feeder tube and allowed to ‘breathe’ through unoccluded spiracles (Figure 1B, Figure 1—figure supplement 1A). Second, the exposed organ is stabilized by an agarose bed and bathed in media (Figure 1C). Third, the animal is kept hydrated in a humidity box (Figure 1—figure supplement 1B). Throughout imaging, animals continue to ingest food, undergo peristalsis, and defecate, which suggests that midguts remain in a state that approaches native physiology. A crucial element is the use of a 20x, high-NA dipping objective, which captures z-stacks that are both wide field (100–300 cells) and high resolution (~1 μm) (Video 3). Time intervals between z-stacks ranged from 5 to 15 min. At room temperature, 72% of animals were alive and responsive after 12–16 hr of continuous imaging (N = 18 animals; median imaging duration, 14.6 hr) (Figure 1—source data 1, Video 4). Nearly all cells remained viable, as revealed by the cell death marker Sytox Green (93–98% viability; Figure 1—figure supplement 3, Video 5). At elevated temperatures (≥29°C), however, the midgut was prone to rupture, so temperature-controlled gene expression by GAL80ts or heat-shock induction proved impracticable. Progesterone-induced GeneSwitch drivers (Mathur et al., 2010) could be a feasible alternative. Volumetric movie of the midgut illustrates the wide-field, high-resolution images that are acquired. Numerous physiological contractions of the midgut are evident. A midgut-associated tracheal branch is visible in the lower left of the video. Scale bar, 70 µm. After 16 hr of continuous imaging, the animal is alive and responsive. Cell viability during extended imaging. As cells die, they become marked by the cell death stain Sytox Green, which is continuously present in the imaging media. After 11 hr of imaging, an individual midgut enterocyte changes from Sytox– (arrowhead, 10.6 hr), to faintly Sytox+ (arrowhead, 11.1 hr), to strongly Sytox+ (arrowhead, 12.0 hr). 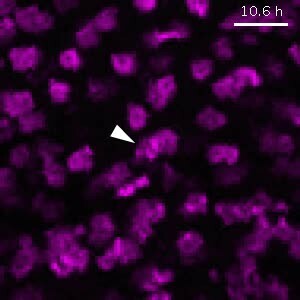 Nuclei are magenta (ubi-his2av::mRFP). Each movie time point is the projection of a confocal z-stack. Scale bar, 20 µm. To minimize interference with native digestion, we used no anesthetics. Hence, ~90% of the raw movies were blurred due to involuntary midgut contractions and voluntary animal movements (Figure 1D). In ~30% of these cases, the blurring was too severe for subsequent analysis. In the other ~70%, the blurring could be corrected by the sequential application of two ImageJ macros, StackReg and Correct 3D Drift (Arganda-Carreras et al., 2006a; Parslow et al., 2014) (Figure 1E–F, Source Code File 1, Video 6), rendering these movies suitable for single-cell tracking and analysis. Movie clip of midgut before (left) and after (right) stack registration. Before registration, blurred cells from tissue movements are evident during timepoints from 20–60 min. After registration, the blurring is negligible. Cyan, all nuclei (ubi-his2ab::mRFP); yellow, stem cells and enteroblasts (esg >LifeactGFP). Each time point is the projection of a confocal z-stack. Scale bar, 20 µm. The study of dynamic cellular events requires that individual cells be identified, tracked and analyzed in space and over time. To facilitate these analyses, we generated a ‘fate sensor’ line with fluorescent, nuclear-localized markers to allow live identification of the midgut’s four major cell types (esgGAL4, UAShis::CFP, GBE-Su(H)-GFP:nls; ubi-his::RFP) (Figure 2A–B; Video 7). (1) Stem cells are marked by CFP and RFP. Stem cells are responsible for virtually all cell divisions. (2) Enteroblasts are marked by CFP, GFP and RFP. Enteroblasts are Notch-activated stem cell progeny that will mature into enterocytes. (3) Enterocytes are marked by RFP and have polyploid nuclei. Enterocytes are terminally differentiated cells that absorb nutrients and that form the bulk of the epithelium. (4) Enteroendocrine cells are marked by RFP and have small, diploid nuclei. Enteroendocrine cells are terminally differentiated cells that secrete enteric hormones. Comprehensive, fate-specific tracking and analysis of individual cells. (A–B) ‘Fate sensor’ midguts enable the live identification of cell types. (A) Stack projection of a single time point from a 10 hr movie (Video 7). Nuclei are distinguishable for four midgut cell types: stem cells (red pseudocolor), enteroblasts (yellow-green pseudocolor), enterocytes (gray, polyploid), and enteroendocrine cells (gray, diploid). Inset shows the zoom region depicted in (B). (B) Genetic design of the fate sensor line (esg >his2b::CFP, GBE-Su(H)-GFP:nls; ubi-his2av::mRFP). Cell types are distinguished by the combinatorial expression of three fluorescent, nuclear-localized markers: enterocytes/enteroendocrine cells (His2ab::mRFP only), stem cells (His2ab::mRFP, His2b::CFP), and enteroblasts (His2ab::mRFP, His2b::CFP, GFP:nls). All scale bars, 10 μm. (C–D) Workflow to identify, track and analyze cells in volumetric movies. (C) Nuclei from raw, multi-channel z-stacks are digitally separated into stem cell, enteroblast, and enterocyte/entero-endocrine populations using channel masks in ImageJ. (D) The three population sets are rendered in 4D in Imaris. Segmentation is performed on each population to identify individual nuclei. Enteroendocrine nuclei are separated from enterocyte nuclei by a size filter. 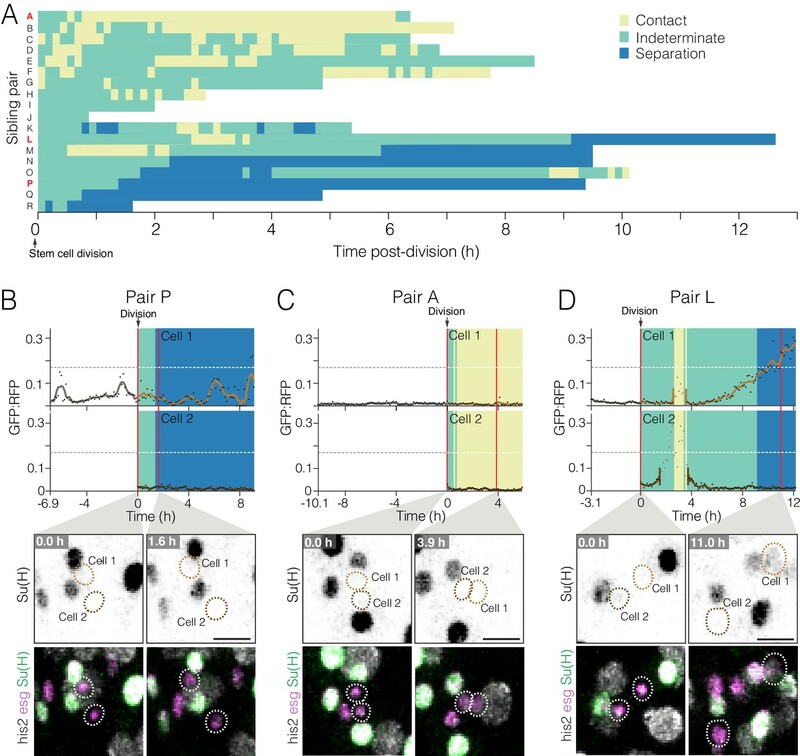 The positions of individual nuclei are correlated between time points to track single cells over time. Ten-hour movie of a ‘fate sensor’ midgut (esgGal4, UAS-his2b::CFP, GBE-Su(H)-GFP:nls; ubi-his2av::mRFP). See Figure 2A–B). Nuclei are distinguishable for four midgut cell types: stem cells (red pseudocolor), enteroblasts (yellow-green pseudocolor), enterocytes (gray, polyploid), and enteroendocrine cells (gray, diploid). Each time point is the projection of a confocal z-stack. Scale bar, 20 µm. To analyze these multichannel, volumetric movies, we developed a semi-automated workflow. 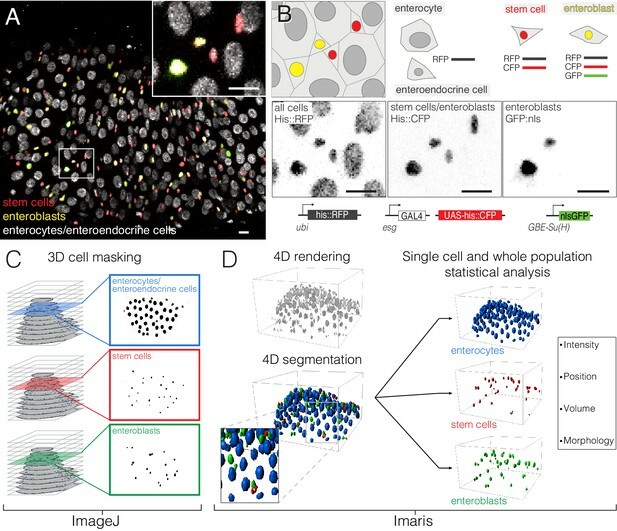 ImageJ and Bitplane Imaris are used to separate marked populations digitally, to identify all cells in each population, and to track these cells for the duration of the movie (Figure 2C–D). 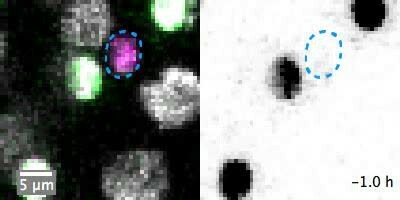 Comprehensive, single-cell tracking enables features such as fluorescence intensity, spatial position and nuclear size to be measured for each individual cell. By multiplying the 100–300 cells in a movie over the hundreds of time points in a 12–16 hr imaging session, we collect tens of thousands of real-time measurements. Unlike prior approaches, which relied on the manual identification and tracking of a few cells, our approach generates single-cell and population-level data in an unbiased manner. To demonstrate the utility of this imaging platform and workflow, we performed proof-of-principle analyses for three core behaviors of midgut renewal: enterocyte extrusion and loss (Figure 3A–F), stem cell division (Figures 3G–H and 4) and enteroblast differentiation (Figures 5–6). Real-time kinetics of enterocyte extrusion and stem cell mitosis. (A–E) Morphometric analysis of a single-enterocyte extrusion. (A) Time-lapse sequence (top) and schematic (bottom) showing a planar view of an extrusion event. The basal region of the extruding cell (tan pseudocolor) is outlined by a six-sided ‘ring’ of E-cadherin::YFP (inverted gray, ubi-DE-cadherin::YFP). Over time, the basal ring closes to a point, and the six neighbor cells (green in schematic) draw into a rosette. The time-lapse images are stack projections. Cyan (ubi-his2av::mRFP) labels all nuclei. See Video 8. 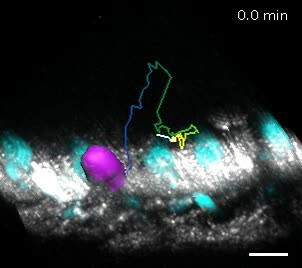 (B) Spatial ‘footprint’ of the E-cadherin::YFP ring in the epithelial plane over time (violet-yellow color scale). The ring remains six-sided throughout closure. (C) Ring closure occurs via ratcheted constrictions. During ring closure, pulses of constriction (shaded background) are interrupted by pulses of relaxation (unshaded background). See Figure 3—figure supplement 1. (D) Kinetics of apical travel. Displacements of the junctional ring (purple) and the cell nucleus (red) are shown over time for the extrusion in (A). The ring (purple trace) advances incrementally via small, apical-and-basal movements. The nucleus (red trace) ejects rapidly into the lumen, then recoils. Apical nuclear travel starts at t = 150 min and ends at t = 263 min (dotted vertical lines). (E) Orthoview of the extrusion depicted in (A). The multicolored line shows the path of the nucleus over time (violet-yellow color scale). Magenta box denotes the E-cadherin::YFP ring, which is visible in this time point (t = 285 min) as a density of YFP at the apical surface. Inverted gray, E-cadherin::YFP (ubi-DE-cadherin::YFP); cyan, all nuclei (ubi-his2av::mRFP). See Video 9. (F) Durations of apical nuclear travel for 18 single-enterocyte extrusions from six movies. Apical travel lasted 37–112 min with a mean ± standard deviation (SD) of 64 ± 18 min. (G–H) Kinetics of stem cell mitoses. (G) Time-lapse sequence of a mitotic event. 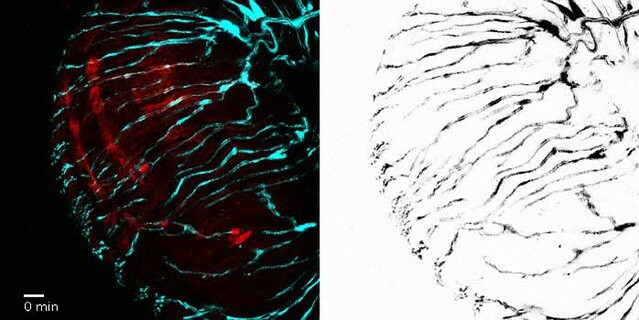 Green, actin (esg >LifeactGFP); yellow, E-cadherin (ubi-DE-cadherin::YFP); red, nuclei (ubi-his2av::mRFP). Panels are partial stack projections of the basal epithelium. See Video 11. (H) Durations of mitosis for 39 cell divisions from 11 movies. Mitoses lasted from 30 to 60 min with a mean ± SD of 43 ± 11 min. All scale bars, 10 μm. Real-time orientations of stem-cell divisions in three reference frames. (A–E) Horizontal-vertical orientations are horizontally biased. (A) Schematic of horizontal (0°) and vertical (90°) orientations. See Figure 4—figure supplement 1. (B) Live orientations of 10 dividing cells specifically at cytokinesis. The distribution is biased toward horizontal (<45°). The red point represents the cell in (D). (C) Live orientations of the same 10 cells throughout mitosis. Each measurement is the orientation of one mitotic cell at one time point, from metaphase to cytokinesis (n = 51 measurements). The distribution is biased toward horizontal (<45°). (D) Two re-orientations in a single mitosis. The red line shows the orientation of condensed chromatin (gray, ubi-his2ab::mRFP) relative to the basal basement membrane (cyan, Concanavalin A-Alexa-647). For clarity, in the 7.5 min and 15 min projections, a clipping plane was applied in the gray channel to exclude an enterocyte nucleus; this nucleus is marked by an asterisk at the left edge of the 30 min projection. Scale bar, 5 µm. See Video 12. (E) Mitotic cells frequently re-orient. Each line shows the horizontal-vertical orientations of a single mitotic cell over time. The 10 cells are the same as those in (B) and (C). All lines start at metaphase (t = 0 min) and continue until cytokinesis (t = 30–60 min). Time intervals were either 5, 7.5, or 15 min. Colors are the same as those in (B); the red line represents the orientation of the cell in (D). (F–H) Longitudinal-circumferential orientations are unbiased. (F) Schematic of longitudinal (0°) and circumferential (90°) orientations. (G–H) Live orientations of 38 dividing cells at cytokinesis. Longitudinal (≤45°) and circumferential (>45°) orientations are near-equal. (I–K) Divisions between two flanking enteroblasts align with the enteroblast-enteroblast axis. (I) Schematic of divisions contacting either two or one enteroblast(s). When two enteroblasts are present, the closer enteroblast is used for measurements (see 'Materials and methods'). (J) Division between two enteroblasts. Orientation is nearly parallel to the axis between the enteroblast nuclei (magenta, GBE-Su(H)-GFP:nls). Gray, stem cell and enteroblast nuclei (esg >his2b::CFP). Scale bar, 10 µm. See Video 14. (K) Live orientations of divisions with two or one flanking enteroblast(s). With two enteroblasts (n = 4 of 18 divisions), orientations are near-parallel to the enteroblast-enteroblast axis. With one enteroblast (n = 11 of 18 divisions), orientations are broadly distributed. Orientations were measured at cytokinesis. Means ± SD are shown. Mann-Whitney test, p=0.01. Whole-population and single-cell analyses of real-time Notch activation. (A–C) A threshold level of Notch activation distinguishes stem cells and enteroblasts. (A) Single-cell measurements of the Notch reporter GBE-Su(H)-GFP:nls from live movies. Cells additionally co-express esg >his2ab::CFP (magenta) and ubi-his2ab::mRFP (gray). GBE-Su(H)-GFP:nls activation is quantified as GFP:RFP (see 'Materials and methods'). For the indicated cells, GFP:RFP = 0.94, 0.27, and 0.01, respectively. (B) GFP:RFP values correlate with visible GFP and nuclear volume. Progenitor (esg+) cells were scored by eye as either GFP-negative (top) or -positive (bottom). 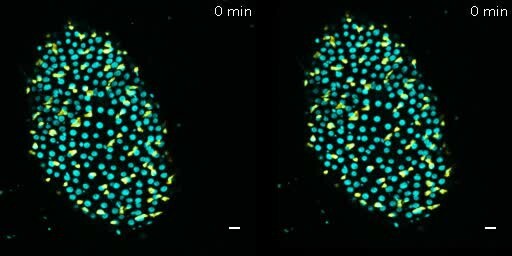 In cells without visible GFP, nearly all GFP:RFP values cluster between 0.0 and 0.2, and most nuclear volumes are small (<200 µm3). In cells with visible GFP, most GFP:RFP values are spread between 0.1 and 1.4, and large nuclear volumes (≥200 µm3), indicative of late enteroblasts, are associated with high GFP:RFPs. The blue dotted lines show the 0.17 enteroblast threshold from (C). (C) GFP:RFP values quantitatively distinguish stem cells and enteroblasts. Gray bars show real-time GFP:RFPs for all esg+ cells in two movies (29,102 GFP:RFPs from 251 cells). Two peaks (GFP:RFP = 0.015, 0.528) are separated by a local minimum (blue dotted line; GFP:RFP = 0.17). 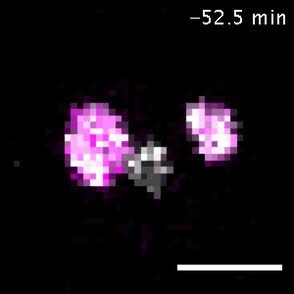 Purple bars (C’ inset) show real-time GFP:RFPs for ‘benchmark’ stem cells prior to an observed mitosis (1,294 GFP:RFPs from 18 pre-mitotic cells). The benchmark stem cell distribution matches the left peak of the esg+ cells, and 99.6% of ‘benchmark’ GFP:RFPs are less than 0.17. Data in (B) and (C) are aggregated from two movies. (D–E) Stem-like cells transition to enteroblasts over multiple hours. (D) Real-time activation of GBE-Su(H)-GFP:nls reveals a transition from a stem-like to an enteroblast state. During a transition period lasting 6.9 hr (gray background), GFP:RFP increases from a baseline of ~0.049 at t = 3.5 hr to the enteroblast threshold of 0.17 (blue dotted line) at t = 10.4 hr. After the transition, GFP:RFP continues to increase and reaches 0.364 at t = 15.0 hr. GBE-Su(H)-GFP:nls shown in green (top) and inverted gray (bottom); esg >his2ab::CFP, magenta; ubi-his2ab::mRFP, gray. See Video 15. (E) Kinetics of three additional enteroblast transitions. Initial baseline GFP:RFPs are <0.17. GFP:RFPs increase from baseline to 0.17 during transition periods lasting from 2.3 to 6.9 hr (gray backgrounds: t = 0.3–7.1 hr (top), 10.0–12.4 hr (middle), 9.5–11.8 hr (bottom)). Initial and final GFP:RFPs are as follows: 0.058, 0.426 (top); 0.069, 0.281 (middle); 0.022, 0.257 (bottom). All cells in (D) and (E) were born before imaging started. Genotype in all panels: esgGal4, UAS-his2b::CFP, Su(H)GBE-GFP:nls; ubi-his2av::mRFP. All scale bars are 5 µm. Dynamics of cell contact and Notch reporter activation in sibling cells after birth. (A) Contacts between newborn siblings are highly variable. Eighteen pairs of sibling cells (rows A–R) were tracked from birth (t = 0.0 hr) to the end of imaging. Color shows the likelihood of sibling–sibling contact based on inter-nuclear distance (Figure 6—figure supplement 1): yellow, inferred contact (inter-nuclear distance <6.0 µm); green, indeterminate (inter-nuclear distance = 6.0–15.5 µm); blue, inferred separation (inter-nuclear distance >15.5 µm). Pairs are ordered from highest A to lowest P contact. Pairs A, L, and P (red labels) are featured in (C), (D), and (B), respectively. (B–D) Contacts between siblings do not correlate with real-time GBE-Su(H)-GFP:nls activation. Graphs show real-time contact status (background colors same as A) and GFP:RFP ratios. Sibling birth is at t=0.0 h. Red vertical lines are the time points shown in the bottom images. (B) Low-contact pair P does not exhibit persistent activation of GBE-Su(H)-GFP:nls. (C) High-contact Pair A does not exhibit persistent activation of GBE-Su(H)-GFP:nls. (D) Indeterminate-low contact Pair L exhibits persistent activation of GBE-Su(H)-GFP:nls in one sibling. The Pair L siblings are probably in contact from t=2.6–3.6 h and are probably separated after t=9.1 h. Note that between t=2.6–3.5 h (Cell 1) and t=1.5–3.6 h (Cell 2), GFP:RFP measurements (grayed dots) are artifactually high because the two cells collide with a third cell, which was a mature enteroblast (Video 18). Because of the intimate proximity between the mature enteroblast and the Pair L siblings during the collision, the high GFP signal of the enteroblast bled over into the surfaces for Cells 1 and 2. The duration of artifactual bleed-over is indicated by gaps in the cells’ interpolated GFP:RFP lines. Genotypes for all panels: esgGal4, UAS-his2b:CFP, Su(H)GBE-GFP:nls; ubi-his2av::mRFP. All scale bars are 10 µm. See Videos 16–18. Enterocytes in the Drosophila midgut, like enterocytes in the mammalian intestine, are lost through apical extrusion (Buchon et al., 2010; Eisenhoffer et al., 2012; Harding and Morris, 1977; Madara, 1990; O'Brien et al., 2011). During extrusion, a cell is ejected out of the epithelium and into the lumen by the concerted contractions of its neighbors (Eisenhoffer and Rosenblatt, 2013). Because this process is seamless, extrusion eliminates apoptotic cells while preserving the epithelial barrier (Gudipaty and Rosenblatt, 2017). Apoptotic enterocytes secrete stem cell-activating mitogens (Liang et al., 2017), so understanding when and how apoptotic enterocytes are extruded is important for understanding midgut turnover. In fixed tissues, studies of extrusion have been challenging because extruded cells leave no trace in the epithelium. Although fixed sections can catch extruding cells ‘in the act’, they do not reveal the dynamics of these transient events. Our imaging platform enabled us to study extrusions live. Most extrusions were enterocytes, which exited the epithelium either as single cells (18 of 34 total extrusions in six independent movies; Figure 3A,F, Figure 3—figure supplement 1; Videos 8 and 9) or as clusters of 2–5 cells (16 of 34 total extrusions). We also observed one extrusion of an enteroendocrine cell (Video 10). Extrusions were distributed comparably across the first and second halves of individual movies. All extrusions were apical. Twelve-hour movie of a single-enterocyte extrusion. The epithelium is oriented with its basal surface toward the microscope objective and its apical surface further away. The basal region of the extruding enterocyte (orange pseudocolor at t=0, 127.5, 285, 442.5 min) is outlined by a ‘ring’ of E-cadherin::YFP. The ring closes down to a point from t=255–442.5 min. The intensity of the ring fluctuates during the first half of closure and becomes consistently bright during the second half. 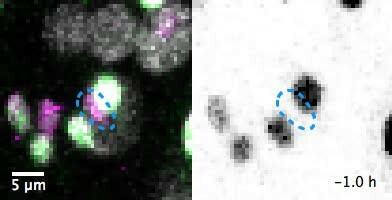 As the ring closes, neighboring cells draw into a rosette. Meanwhile, the nucleus of the extruding cell (yellow pseudocolor) starts to drop apically at t=150 min, hits its deepest luminal position at t=262.5 min, and recoils from t=262.5–307.5 min. Cyan, all nuclei (ubi-his2av::mRFP); inverted gray, E-cadherin (ubi-DE-cadherin::YFP). Each time point is the projection of a confocal stack. Scale bar, 10 µm. Orthoview of extrusion shown in Video 8. The nucleus of the extruding enterocyte (magenta) ejects out of the epithelium (t=150–165 min) and penetrates into the lumen (t=165–265 min). It subsequently recoils and eventually comes to rest on the apical epithelium (t=263–443 min). The multicolored line shows the path of nuclear travel over time (violet-yellow color scale; see Figure 3D for legend). Cyan, all nuclei (ubi-his2av::mRFP); gray, E-cadherin (ubi-DE-cadherin::YFP). Scale bar, 10 µm. Four-hour movie of an enteroendocrine cell extrusion. The epithelium is oriented with its basal surface toward the microscope objective and its apical surface further away. 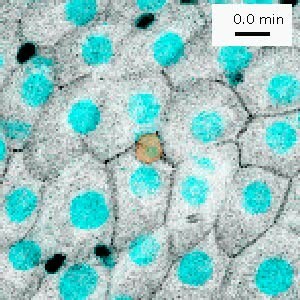 The basal region of the extruding cell (tan pseudocolor at t=0, 75 min) is outlined by a ring of E-cadherin::YFP (inverted gray signal at cell boundaries). The extruding cell is presumed to be enteroendocrine because it has a small, presumably diploid, nucleus and because it lacks expression of esg. (esg >his2b::CFP is inverted gray signal in nuclei.) The E-cadherin ring closes to a point over the period t=0–180 min. Meanwhile, the enteroendocrine cell nucleus drops apically from t = 0–143 min. Cyan, all nuclei (ubi-his2av::mRFP); inverted gray, E-cadherin (ubi-DE-cadherin::YFP) and stem/enteroblast nuclei (esg >his2b::CFP). Each time point is the projection of a confocal stack. Scale bar, 10 µm. To gain insight into extrusion dynamics, we performed fine-grained morphometric analysis on three single-enterocyte extrusions (Figure 3A–E; Figure 3—figure supplement 1). Enterocytes exited the epithelium through constriction of a basal junctional ‘ring’. Junctional rings were six-sided and marked by E-cadherin::YFP and myosin::GFP (myosin light chain kinase, or sqh::GFP) (Figure 3A, Video 8). As extrusions progressed, rings closed to a point and eventually vanished (Figure 3B, Video 8). Meanwhile, neighbor enterocytes drew into rosettes with the extruding cells at their center. Ring closure required ~4–6 hr for completion (Figure 3—figure supplement 1D). Unexpectedly, we found that ring closure was pulsatile and ratcheted. Ratcheted processes are characterized by pulses of constriction that alternate with pulses of stabilization or even relaxation (Coravos et al., 2017). All three extrusions exhibited 6–12 of such alternating pulses (Figure 3C, Figure 3—figure supplement 1A–C). Cumulative times of constriction were similar to cumulative times of stabilization/relaxation. By contrast, rates of constriction generally exceeded rates of relaxation, which drove net closure of the ring over time (Figure 3—figure supplement 1A–C). Ratcheting has not previously been implicated in cell extrusion (Kuipers et al., 2014) but is well-known to drive cell deformation in early embryogenesis (Martin et al., 2009; Rauzi et al., 2010). In embryos, however, pulses are apical, last only 1–2 min, and reshape cells without removing them. By contrast, in enterocyte extrusion, pulses are basal, last 30–60 min, and are associated with delamination. For an extruding cell to be shed from the epithelium, the junctional ring must not only close but also travel apically toward the lumen. We compared apical travel of the ring to that of the cell nucleus for the extrusion in Figure 3A. The ring advanced slowly, with stuttering, apical-and-basal movements that produced net apical progress over 5 hr of ring closure (Figure 3D). By contrast, the nucleus shot out of the epithelium in only 15 min (Figure 3D–E; Video 9, t=150–165 min) and continued to penetrate deeper into the lumen over the next 1.6 hr (Figure 3D–E; Video 9, t=165–263 min). After reaching maximum depth, the nucleus recoiled and came to rest on the apical epithelium (Figure 3D–E; Video 9, t=263–443 min). These distinct kinetics suggest that the ring and the nucleus use different mechanisms for apical travel. Altogether, these analyses provide first morphometric insights on homeostatic cell extrusions in real time. They demonstrate the ability of our platform to reveal novel extrusion behaviors, such as ratcheting, and to enable direct comparison of concurrent subcellular events, such as ring and nuclear travel. Through these abilities, our platform opens the door to a dynamic and quantitative understanding of cell extrusion during organ turnover. Tissue homeostasis requires the replacement of extruded cells by new cells. In the midgut, new cells are generated through stem cell divisions, and terminal daughters are typically post-mitotic. Although time-lapse imaging has unique potential to reveal division behaviors (Park et al., 2016), the divisions of midgut cells have been challenging to capture. To date, live divisions have been reported in only one study, which examined pathogen-stimulated midguts ex vivo (Montagne and Gonzalez-Gaitan, 2014). We surveyed our movies of near-native midguts for physiological divisions. Thirty-nine mitoses were identified in 11 independent movies, which had a combined duration of 122 hr. The average mitosis lasted 43 ± 11 min (Figure 3G–H; Figure 3—source data 1, Video 11). Together, these measurements imply a mitotic index of 0.28% (see 'Materials and methods' for calculation), which is less than the 1–2% mitotic index obtained from counts of phospho-histone H3+ cells in fixed midguts (Jin et al., 2017; Kolahgar et al., 2015; Montagne and Gonzalez-Gaitan, 2014). No divisions were identified in 14 additional movies. Within individual movies, division rates did not trend upward or downward over time. This absence of drift suggests that division rates were reduced not by cumulative imaging stress, but rather by elements that were already present when imaging began or that occurred stochastically. To lessen this inhibitory effect, adjustments to the media formulation would be one attractive approach. Mitosis of a putative stem cell. Each mitosis was exhibited by a unique cell. The vast majority of these were presumably stem cells. However, a recently described cell type, the enteroendocrine precursor cell, accounts for <5% of mitoses (Chen et al., 2018). Our movies lacked markers to distinguish stem cells from enteroendocrine precursors, so the latter may have been responsible for some observed mitoses. We investigated how mitotic cells dynamically orient in 3D space. In general, epithelial divisions can be considered in two orthogonal frames of reference: horizontal-vertical and longitudinal-circumferential. Horizontal-vertical orientation is defined by the epithelial plane (Figure 4A) and, in development, serves to determine daughter fates (Cayouette and Raff, 2003; Dong et al., 2012; Guo and Ohlstein, 2015; Williams et al., 2011). Longitudinal-circumferential orientation is defined by organ shape (Figure 4F) and determines whether the organ grows longer or wider (Mochizuki et al., 2014; Schnatwinkel and Niswander, 2013; Tang et al., 2011). In epithelial development, well-understood mechanisms orient cell divisions for proper morphogenesis. In epithelial homeostasis, however, the existence of analogous orientation mechanisms is a subject of debate. To shed light on this topic, we investigated whether native mitoses in the midgut exhibited bias in horizontal-vertical or longitudinal-circumferential orientations. While performing these two analyses, we noticed an unexpected, third frame of reference: neighbor enteroblasts (Figure 4I). Below, we describe real-time mitotic orientation in these three reference frames. First, we considered horizontal-vertical orientation (Figure 4A–E, Figure 4—source data 1). Horizontal-vertical orientations at cytokinesis ranged broadly (1.6°−72°), but were biased toward horizontal. Of 10 dividing cells, four were <5° and seven were <45° (Figure 4B). These findings are consistent with prior analyses of dividing cells in fixed midguts (Goulas et al., 2012; Ohlstein and Spradling, 2007). Do horizontal-vertical orientations stay constant throughout division? Analyzing the same 10 cells from metaphase to telophase, we found that orientations were, as a group, also biased toward horizontal; of 41 measurements, seven were <5° and 33 were <45° (Figure 4C). Interestingly however, this stable, population-level trend belied the dynamic re-orientations of individual cells. Tracking single cells over time, we found that 8 of the 10 cells re-oriented by ≥15° at least once, and four re-oriented by ≥30° (Figure 4D–E; Videos 12 and 13). Re-orientations even occurred repeatedly during a single mitosis; 3 cells re-oriented by ≥15° two or three times. These frequent, sometimes dramatic, re-orientations were not triggered by peristaltic contractions as no temporal correlation was observed between the two types of events. The ability of mitotic stem cells to re-orient dynamically, a feature uniquely visible in live imaging, carries implications for how measurements of spindle angles in fixed midguts are interpreted. Orthoview of a mitosis with two horizontal-vertical re-orientations. The first re-orientation occurs between metaphase (24° at 7.5 min) and anaphase (60° at 15 min). The second re-orientation occurs between anaphase (62° at 22.5 min) and telophase (2° at 30 min). Gray channel, condensed chromatin (ubi-his2ab::mRFP). The red line indicates the spindle axis. The cyan line indicates the basal plane, as revealed by the basement membrane stain Concanavalin A-Alexa 647 (not shown). At each time point, the mitotic cell is shown as an orthogonal projection from the vantage of a plane that is parallel to the spindle axis and normal to the basal epithelial plane. For clarity, a clipping plane was applied in the gray channel to exclude an adjacent enterocyte nucleus. Scale bar, 5 µm. Orthoview of a second mitosis with two horizontal-vertical re-orientations. The top panel shows condensed chromatin of the dividing cell (ubi-his2ab::mRFP). The red line indicates the spindle axis. The cyan line indicates the basal plane, as revealed by the basement membrane stain Concanavalin A-Alexa 647 (not shown). The bottom panel reproduces the graph from Figure 4E, with the time-resolved orientations of this particular cell in red. The first re-orientation occurs during metaphase (from 16° at 5 min to 0° at 15 min). The second re-orientation occurs between metaphase (1° at 20 min) and anaphase (18° at 25 min). Scale bar, 5 µm. Second, we considered longitudinal-circumferential orientation (Figure 4F–H). Measuring 38 cells at cytokinesis, we found that 20 cells were ≤45° and 18 cells were >45° (Figure 4F–H). Hence, longitudinal-circumferential orientations are unbiased. The nature of our movies precluded us from examining a potential exception to this lack of bias: divisions at midgut compartment boundaries. Spradling and colleagues have reported that compartmentalization of the midgut into distinct, stereotyped regions is reinforced by clonal partitioning (Marianes and Spradling, 2013). Daughter cells generally remain in the same compartment as their mother stem cell, and stem-cell clones do not cross most compartment boundaries (Marianes and Spradling, 2013). As compartment boundaries are circumferential, a possible explanation for clonal partitioning is that boundary-localized divisions are oriented circumferentially. However, our movies lacked live boundary markers, so the small minority of divisions that may have occurred at boundaries could not be distinguished from the large majority of divisions that occurred within compartments. Further study will be needed to determine whether boundary-localized divisions represent a special case of circumferential bias. Finally, we observed that a third, local reference frame formed when two enteroblasts flanked a dividing cell (Figure 4I–K). In this three-cell arrangement, divisions occurred nearly parallel to the two neighbor enteroblasts (4 of 18 divisions; Figure 4J,K, Figure 4—source data 1). By contrast, divisions had a broad range of orientations if only one neighbor enteroblast was present (11 of 18 divisions; Figure 4K). When trapped between two enteroblasts, daughter cells at cytokinesis hurled into and forcibly collided with the enteroblast nuclei (Figure 4J; Video 14, t=15–22.5 min). These observations suggest that physical contact between stem cells and enteroblasts is a spatial cue that orients the mitotic spindle. Division of a stem cell that contacts two enteroblasts. Division orientation aligns with the axis between the two enteroblast nuclei (magenta, GBE-Su(H)-GFP:nls). At cytokinesis (t=15–22.5 min), the new daughter nuclei hurl into the enteroblast nuclei, which recoil in response. Gray, stem cell and enteroblast nuclei (esg >his2b::CFP). Each time point is the partial projection of a confocal stack. Scale bar, 10 µm. In summary, these analyses provide first views of how live stem cells orient their divisions within the midgut’s tubular epithelium. They also reveal mitotic behaviors, such as frequent horizontal-vertical re-orientations, that are undetectable in fixed samples. Examining three reference frames, we found three orientation patterns. (1) Biased horizontal orientations. In future work, a crucial question will be whether, and if so how, horizontal orientations promote symmetric daughter fates (Goulas et al., 2012; Guo and Ohlstein, 2015; Kohlmaier et al., 2015; Montagne and Gonzalez-Gaitan, 2014; Sallé et al., 2017). (2) Unbiased longitudinal-circumferential orientations. This balanced distribution may help to maintain constant organ shape over time. (3) Local orientation by two enteroblasts. This unanticipated finding supports the notion that stem-cell–enteroblast adherens junctions, which are unusually pronounced (Ohlstein and Spradling, 2006), could orient the divisions of midgut stem cells, akin to other Drosophila stem cells (Inaba et al., 2010; Le Borgne et al., 2002; Lu et al., 2001). In our analysis, all mitoses occurred in the midgut’s R4a-b (P1-2) region that is exposed by the cuticular window; whether divisions in other regions, or at region boundaries, behave similarly is an open question. Looking forward, these findings provide a basis for the direct investigation of midgut division orientation and for probing the relationship between orientation and fate. Along with cell division and loss, cell differentiation is the third core behavior of tissue renewal. In the Drosophila adult midgut, differentiation in the enteroblast-enterocyte lineage is controlled by Delta-Notch. Delta ligand, which is expressed predominantly in stem cells, activates Notch receptors on stem (or stem-like) cells. At low levels, Notch activity is compatible with stemness, but at higher levels, it triggers enteroblast differentiation (Bardin et al., 2010; Biteau and Jasper, 2014; Kohlmaier et al., 2015; Micchelli and Perrimon, 2006; Ohlstein and Spradling, 2006Ohlstein and Spradling, 2007; Perdigoto et al., 2011; Zeng and Hou, 2015). Fate sensor midguts (Figure 2) enable Notch activity to be measured live. GBE–Su(H)-GFP:nls provides a sensitive readout of Notch transcriptional activation (de Navascués et al., 2012; Furriols and Bray, 2001; Guisoni et al., 2017; Housden et al., 2014), while ubi-his2av::mRFP provides a stable reference signal. We used these two markers to establish a normalized metric of Notch activity. First, to account for differences between movies, we normalized the values of GFP and RFP intensities within a given movie to a 0-to-1 scale. Second, to account for tissue depth and other artifacts within a single movie, we used these normalized GFP and RFP intensities to calculate the ratio of GFP:RFP for each esg >his2ab::CFP progenitor cell at each time point. 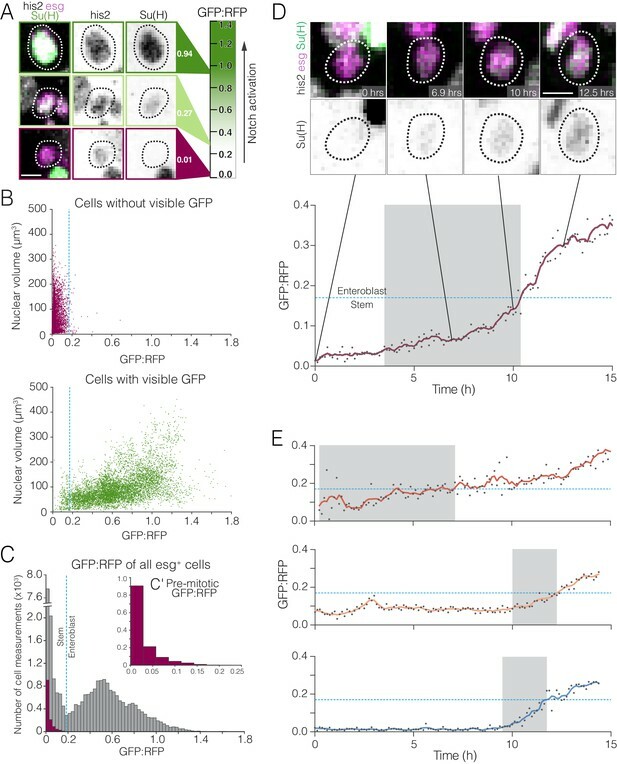 This two-part calculation of real-time GFP:RFP enables Notch activity to be compared over time and between cells, even in different movies. We asked whether real-time GFP:RFPs are consistent with conventional indicators of enteroblast differentiation. The numeric values of GFP:RFPs, which ranged from 0.0 to 1.8, generally fit with subjective evaluations of GFP intensities (Figure 5A–B). In addition, population-level distributions of GFP:RFP were similar at different imaging depths, over time within a single movie, and across different movies. Furthermore, esg++ with large nuclei (≥200 µm3) often exhibited high GFP:RFPs, whwhereas cells with low GFP:RFP typically had small nuclei (Figure 5B). This association of high GFP:RFPs with large but not small enteroblast nuclei fits with prior observations that endoreplication is characteristic of late enteroblasts (Jiang et al., 2009; Kohlmaier et al., 2015; ; Perdigoto et al., 2011; Xiang et al., 2017; Zhai et al., 2017). Altogether, these findings support the use of GFP:RFPs as a metric of Notch activation. Having validated this metric, we used GFP:RFPs to measure Notch activity in stem cells and enteroblasts. Genetic modulation of Notch signaling had revealed that stem and enteroblast identities are characterized by low and high activation (Perdigoto et al., 2011), but actual levels of Notch signaling were not quantified. We wondered whether GFP:RFPs could quantitatively distinguish stem cells and enteroblasts in real time. Examining GFP:RFPs for all esg++ cells in two fate sensor movies (29,102 values; 251 cells), we found that their distribution is—suggestively—bimodal. A local minimum at GFP:RFP=0.17 separates a sharp left peak (GFP:RFP=0.015) and a broad right peak (GFP:RFP=0.528) (Figure 5C, Figure 5—source data 1). An appealing interpretation of this bimodality is that the left peak represents stem cells and the right peak represents enteroblasts. To test this interpretation directly, we cross-correlated Notch activity with mitotic behavior. Mitosis is near-exclusive to stem cells, so cells that went through mitosis during imaging were identifiable as stem cells, independent of GFP:RFP. The GFP:RFPs of these cells in the time points prior to their observed mitoses were used to create a ‘benchmark’ collection of GFP:RFPs from known stem cells (1,294 GFP:RFPs; 18 cells). The benchmark collection of stem cell GFP:RFPs was compared to all progenitor GFP:RFPs. If the left peak of the esg++ represents stem cells, then its GFP:RFP profile should resemble the profile of the ‘benchmark’ stem cells. Indeed, the two profiles nearly matched (Figure 5C′). Furthermore, 99.61% of GFP:RFPs for benchmark stem cells were less than the 0.17 threshold. This correspondence implies that stem cells populate the left peak and enteroblasts the right peak. Supporting this interpretation, the number of data points in the left and right peaks have a proportion of 4:3, which resembles the proportions of stem cells to enteroblasts that have been reported previously in fixed tissues (Guisoni et al., 2017; O'Brien et al., 2011). On the basis of these findings, we conclude that GFP:RFP=0.17 marks a threshold level of Notch activation that functionally distinguishes stem cells from enteroblasts. The precise value of 0.17 is probably specific to our particular microscope and imaging parameters, and a different microscope system would require re-assessment of the enteroblast threshold through measurements of normalized GBE-Su(H)-GFP:nls intensities. Nonetheless, our findings argue that when Notch activity reaches a specific, critical level, cells transition from a stem-like state to an enteroblast state. A fundamental aspect of fate transitions is the time over which they occur. Fast transitions would allow cells to respond nimbly to acute challenges, whereas slow transitions would allow cells to receive and integrate a large number of fate-influencing signals. In this manner, the kinetics of fate transitions can define how an organ responds to changing external environments. Midgut fate transitions have not been measured directly to date. For enteroblasts, an upper limit of two days can be inferred from observations that enteroblasts are present in stem-cell clones two days post-induction (de Navascués et al., 2012; Ohlstein and Spradling, 2007). In developing tissues, however, activation of Notch target genes can occur in minutes-to-hours (Corson et al., 2017; Couturier et al., 2012; Gomez-Lamarca et al., 2018; Housden et al., 2013; Vilas-Boas et al., 2011). This precedent raises the possibility that Notch-mediated enteroblast transitions in the midgut could occur over a period that is considerably shorter than two days. To examine enteroblast transitions directly, we measured the rate of GBE–Su(H)-GFP:nls activation in movies of fate sensor midguts. A cell was scored as undergoing an enteroblast transition if GFP:RFP persistently increased from below to above the 0.17 threshold. From 95 cells with initial GFP:RFP <0.17 in two movies, five such transitions were identified. We analyzed kinetics for four of these, each of which occurred in a cell that was born before imaging started (Figure 5D–E, Video 15). In the incipient enteroblast (blue dotted circle), GBE-Su(H)-GFP:nls is initially undetectable (GFP:RFP=0.014 at t=0.0 hr). Over time, its GFP intensity increases, eventually reaching the enteroblast threshold (GFP:RFP=0.18 at t=10.5 hr). See Figure 5D. Left video: green, GBE-Su(H)-GFP:nls. ; magenta, stem cell and enteroblast nuclei (esg >his2b::CFP); gray, all nuclei (ubi-his2av::mRFP). Right video: inverted gray, GBE-Su(H)-GFP:nls. Each time point is the partial projection of a confocal stack. Scale bar, 2 µm. We found that enteroblast transitions (Figure 5D–E, gray background shading) occurred over multiple hours (2.4–6.9 hr)—faster than the 2 day upper limit implied by clones, and slower than the minutes observed in some other tissues. Higher initial GFP:RFPs did not correlate with shorter transition times. Whether the imaging protocol itself affected these kinetics is difficult to ascertain, but cumulative imaging stresses were probably not a factor as transitions that occurred later in imaging sessions did not have consistently slower or faster increases in GFP:RFP. Intriguingly, we also observed esg++ in which GFP:RFP fell from above to below 0.17 over several hours. These events might suggest that some nascent enteroblasts revert to a stem-like state, at least in terms of Notch activity. If so, then enteroblast specification, as marked by loss of mitotic capacity, occurs before commitment, in which terminal fate becomes irreversible. This two-step process is consistent with our observed, multi-hour timescale of Notch activation: during early transition stages, a prolonged period of low-level Notch activity probably results in prolonged expression of high-affinity Notch target genes. These targets, which are currently unknown, could serve to initialize a bistable switch that culminates in irreversible fate commitment (Bray and Gomez-Lamarca, 2018; Ferrell and Xiong, 2001). By lengthening the time between specification and commitment, slower activation may provide nascent enteroblasts with more opportunities to ‘backtrack’ if the tissue environment changes. In order to activate Notch, a prospective enteroblast must physically contact a Delta-expressing cell. In principle, newborn sibling cells would be ideally suited to engage in Notch-Delta interactions with each other (Guisoni et al., 2017): newborn cells express both Notch and Delta (Bardin et al., 2010; Ohlstein and Spradling, 2007), and cytokinesis leaves sibling cells juxtaposed. Sibling–sibling Notch activation requires that the two siblings stay in contact long enough to overcome the time delays inherent to Delta-Notch lateral inhibition (Barad et al., 2010; Du et al., 2017; Guisoni et al., 2017). However, fixed-gut studies of twin spot clones imply that after cytokinesis, some sibling pairs become separated (O'Brien et al., 2011). If sibling contacts can be transient, then the relationship between contact dynamics and Notch activation kinetics becomes crucial to enteroblast specification. To investigate contact dynamics, we sought to visualize contacts between siblings directly by incorporating a membrane-localized YFP into our fate sensor line, which already contained nuclear-localized CFP, GFP, and RFP (Figure 2A–B). However, we were unable to parse the YFP signal without sacrificing sensitivity in the critical GBE-Su(H)-GFP:nls channel. As an alternative, we evaluated whether contact between siblings could be inferred from the distance separating their nuclei. To compare cell-cell contact and inter-nuclear distance directly, we used movies of midguts in which progenitor cell boundaries were visualized by LifeactGFP and nuclei by His2av::RFP (Figure 6—figure supplement 1, Figure 6—figure supplement 1—source data 1). This analysis revealed two strong correlations: progenitors with inter-nuclear distance <6.0 µm were nearly always in contact, and progenitors with inter-nuclear distance >15.5 µm were nearly always separated. Inter-nuclear distances between 6.0–15.5 µm did not correlate with either contact or separation. On the basis of these findings, we designated three classifications: inferred contact (inter-nuclear distance <6.0 µm), indeterminate (inter-nuclear distance ≥6.0 and≤15.5 µm), and inferred separation (inter-nuclear distance >15.5 µm). We used these classifications to examine the contact dynamics of sibling pairs in movies of fate sensor midguts. When analyzing 18 sibling pairs with known birth times, we found that they exhibited a broad diversity of contact behaviors (Figure 6A, Figure 6—source data 1). At one extreme were high-contact pairs, which generally stayed in place after cytokinesis (pairs A–C, Figure 6A). At the other extreme were low-contact pairs, which separated soon after cytokinesis (pairs N–R, Figure 6A). Eight of 18 pairs separated for at least one hour; two pairs separated and contacted repeatedly; and six pairs appeared to separate permanently. Notably, these dynamic, variable contact behaviors could not have been deduced from static images. Our observation that sibling cells routinely lose contact suggests that a substantial proportion of true sibling pairs may be missed by conventional fixed-gut assays that consider only contacting pairs. Does sibling contact correlate with real-time Notch activation? To the contrary, both high- and low-contact siblings generally maintained low GFP:RFPs (Figure 6B–C, Videos 16 and 17). Of the 36 individual siblings that we tracked (Figure 6A), only one showed persistent activation of Notch (Cell 1 of Pair L, Figure 6D; Video 18). This particular cell was probably in contact with its sibling for at least one hour, perhaps longer, before its GFP:RFP began to increase (Figure 6D, t=4.0 hr). During the subsequent 6.2 hr, GFP:RFP climbed to the enteroblast threshold even after the two siblings probably lost contact (Figure 6D, t=9.1 hr). (Note that in Figure 6D, a collision of the Figure 6D siblings with a mature enteroblast caused GFP:RFP measurements to spike artifactually between t=2.6–3.5 hr (Cell 1) and t=1.5–3.6 hr (Cell 2). See Figure 6D caption and Video 18.) All other sibling cells remained stem-like, with no persistent Notch activation, until the end of imaging. Had imaging continued, it is possible that additional siblings might have transitioned to enteroblasts. Unfortunately, the influence of sibling contacts on such hypothetical fates cannot be assessed. Nonetheless, a simple model in which sibling–sibling contact causes rapid, asymmetric Notch activation, akin to that of Drosophila sensory organ precursor cells (Schweisguth, 2015), is not supported by our live data. A low-contact sibling pair (Pair P; Figure 6A,B) does not activate GBE-Su(H)-GFP:nls. Following their birth at t=0.0 hr, the two siblings move apart and have probably lost contact by t=1.4 hr (inter-nuclear distance >15.5 µm; c.f. Figure 6—figure supplement 1). The mother stem cell is indicated by the blue dotted circle at t=−1.0 hr; the two siblings are indicated by the two blue dotted circles at t=0.0 and t=9.2 hr. No GFP expression is apparent in either sibling. Left video: green, GBE-Su(H)-GFP:nls; magenta, stem cell and enteroblast nuclei (esg >his2b::CFP); gray, all nuclei (ubi-his2av::mRFP). Right video: inverted gray, GBE-Su(H)-GFP:nls. Each time point is the partial projection of a confocal stack. Scale bar, 5 µm. A high-contact sibling pair (Pair A, Figure 6A,C) does not activate GBE-Su(H)-GFP:nls. Following their birth at t=0.0 hr, the two siblings probably remain in contact (inter-nuclear distance <6.0 µm; c.f. Figure 6—figure supplement 1) for at least 6.0 hr. The mother stem cell is indicated by the blue dotted circle at t=−1.2 hr; the two siblings are indicated by the two blue dotted circles at t=0.0 and t=6.0 hr. No GFP expression is apparent in either sibling. Left video: green, GBE-Su(H)-GFP:nls; magenta, stem cell and enteroblast nuclei (esg >his2b::CFP); gray, all nuclei (ubi-his2av::mRFP). Right video: inverted gray, GBE-Su(H)-GFP:nls. Each time point is the partial projection of a confocal stack. Scale bar, 5 µm. A sibling pair exhibits asymmetric Notch activation (Pair L, Figure 6A,D). Following their birth at t=0.0 hr, the two siblings are probably in contact from t=2.6–3.6 hr, in indeterminate contact from t=3.6–9.0 hr, and separated after t=9.0 hr. The mother stem cell is indicated by the blue dotted circle at t=−1.0 hr. The two siblings are indicated by the two blue dotted circles at t=0.0 and 12.2 hr. A single blue dotted circle at t=10.2 hr indicates when the Notch-activated sibling crosses the enteroblast threshold (GFP:RFP=0.17; c.f. Figure 6D). This sibling exhibits nascent GFP signal at 4.0 hr and increases in GFP intensity for the rest of the movie. The other sibling does not exhibit detectable GFP, but from t=1.5–3.6 hr, it collides with a high-GFP enteroblast (orange dotted circle), which causes GFP signal to ‘bleed over’ in the GFP:RFP analysis (Figure 6D). Left video: green, GBE-Su(H)-GFP:nls; magenta, stem cell and enteroblast nuclei (esg >his2b::CFP); gray, all nuclei (ubi-his2av::mRFP). Right video: inverted gray, GBE-Su(H)-GFP:nls. Each time point is the partial projection of a confocal stack. Scale bar, 5 µm. A delay in Notch activation? Activation of Notch in new cells did not occur immediately, but rather several hours after birth. In Figure 6D, the Notch-activating sibling was 10 hr old when it reached the enteroblast threshold. In Figure 5D–E, cells had already been imaged for 7–12 hr when they reached the enteroblast threshold; as all of these four cells were born before imaging started, their elapsed times after birth were even longer. Because midgut cell divisions are asynchronous and stochastic, this post-birth delay in Notch activation would have been difficult to uncover without the time-resolved tracking of single cells. Our finding that Notch activation is delayed raises at least three discussion points. First, it may explain why fewer enteroblast outcomes were observed using live versus fixed approaches. In our live movies, only 1 of 18 sibling pairs exhibited asymmetric Notch activation (Figure 6D). By contrast in prior, fixed studies that also used 2-day midguts, 20–30% of twin-spot sibling clones exhibited asymmetric, stem-enteroblast fates (Chen et al., 2015; O'Brien et al., 2011). A major difference in the two approaches is timescale: hours for live imaging, compared with days to weeks for twin-spot clones. With Notch activation delayed, some newborn cells that appeared stem-like during an hours-long movie might eventually have become an enteroblast or enterocyte in a days-old twin-spot clone. In this manner, the delay in Notch activation may have caused enteroblast fates to be underestimated in live movies. Second, an important caveat is that we do not presently know whether Notch activation is comparably delayed in intact, unperturbed animals. Some potential confounding factors, such as the time required for GFP biosynthesis (Balleza et al., 2018; Couturier et al., 2012; Housden et al., 2013; Kawahashi and Hayashi, 2010; Vilas-Boas et al., 2011), involve timescales of minutes and are thus unlikely to be responsible for a delay of hours. However, because of technical challenges with pinpointing birth times for midgut cells in unperturbed animals, we cannot exclude the possibility that delayed activation is a consequence of the imaging protocol and not native physiological behavior. Third, if delayed activation is physiological, then how exactly is it generated? And what are the consequences for dynamic fate control? One attractive notion is that a period of latency after birth could enable a cell to integrate a broad range of signals before choosing to either differentiate or self-renew. By allowing cells to process intrinsic and extrinsic fate signals fully, a latent ‘waiting’ period could ensure that individual cell fates are coordinated with overall organ needs. 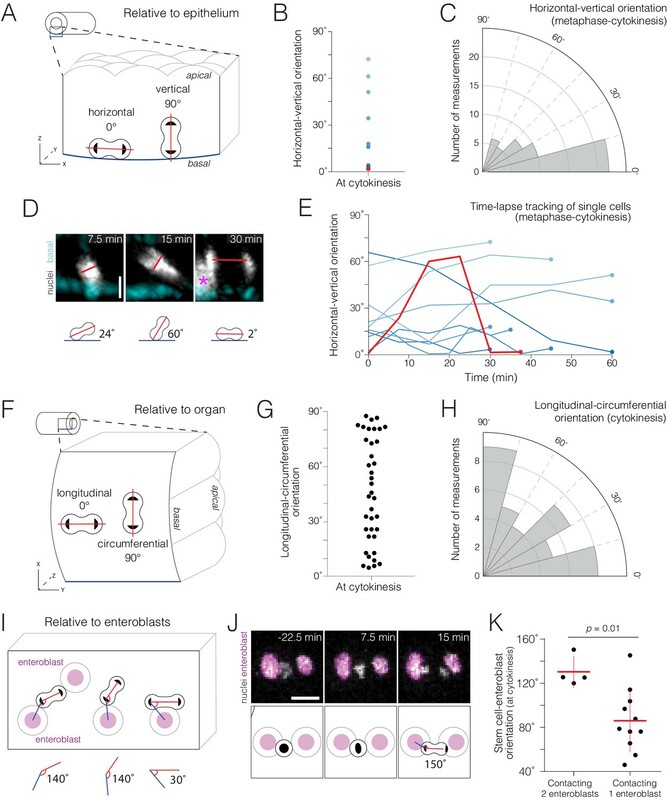 The Drosophila adult midgut is a premier model for organ renewal, but understanding the dynamics of renewal has been hampered by a lack of robust methodology for live imaging. Here, we have presented an imaging platform that captures the midgut in a near-native state within a live animal, yielding movies of exceptional visual quality and duration. In conjunction, we have described a pipeline for comprehensive, 4D movie analysis. We applied this pipeline to our movies for proof-of-principle analyses that corroborated fixed-tissue observations and uncovered new renewal behaviors. These novel findings ranged from descriptions of the time-resolved, single-cell dynamics of division orientation and apical extrusion to large-scale, population-level measurements of Notch activation. 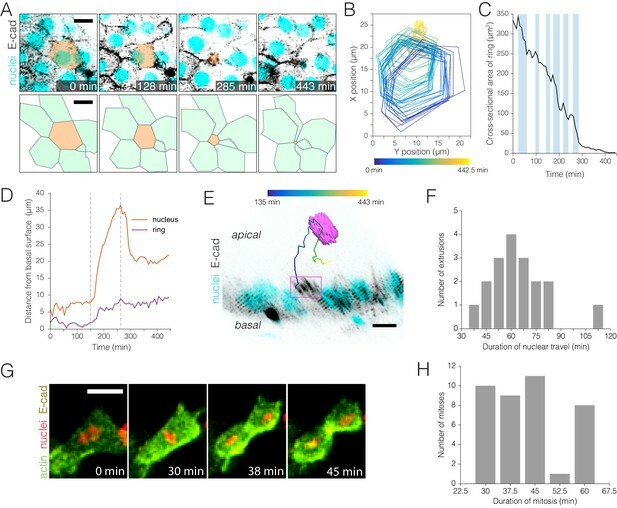 The ability to span cell- and tissue-level scales simultaneously over extended imaging periods opens the door to quantitative study of the spatiotemporal complexity of tissue renewal. Despite these advances, our platform also has limitations. The positioning of the dorsal window restricts imaging to one organ region, so region-to-region comparisons cannot be made in real time. The media that covers the open window also dilutes the circulating hemolymph, which contains molecules that signal to midgut cells. Further refinement of our media formulation might help to restore division rates to native levels and to extend midgut viability beyond 16 hr. Similar improvements might be achieved with reduced exposure to laser light, for instance via a spinning disk set-up. Indeed, such enhancements will be needed to reach the paramount goal of capturing serial divisions of a single stem cell and tracing full lineages. Post-acquisition, our current registration algorithms cannot resolve movement-induced blurring in ~30% of raw movies; more sophisticated algorithms that correct for z-movements within a stack would render many of these movies analyzable. 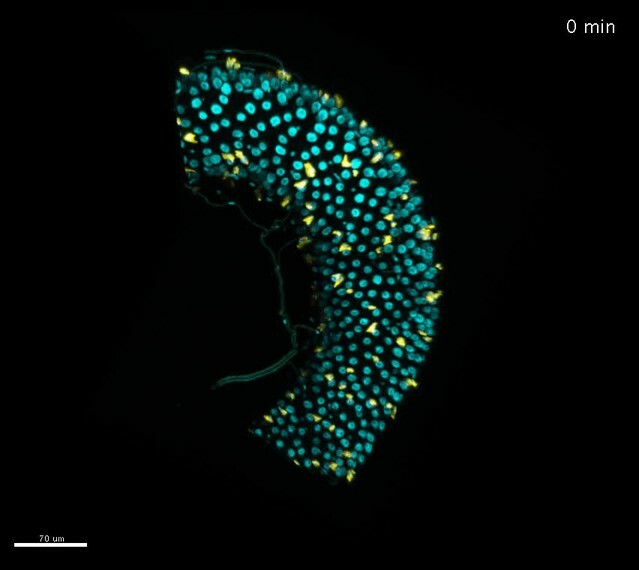 In addition to midgut cell dynamics, our platform offers the opportunity to investigate other biological phenomena in the Drosophila abdomen. Animals ingest food during imaging, which enables real-time observation of events, such as colonization by ingested pathogens, that occur in the midgut lumen. By shifting the position of the cuticular window, the platform could also be adapted to study events in other abdominal organs, including ovary, testis, Malpighian tubule, and hindgut. We anticipate that long-term imaging of Drosophila adults will lead to a new, dynamic understanding of the cell and tissue behaviors that govern the form and physiology of mature organs. esgGAL4 (Kyoto DGRC); ubi-his2av::mRFP (BL23650); breathlessGal4, UAScyt-GFP (Mark Metzstein); UAS-LifeactGFP (BL35544); UAS-his2b::CFP (Yoshihiro Inoue) (Miyauchi et al., 2013); GBE-Su(H)-GFP:nls (Joaquin de Navascués) (de Navascués et al., 2012); act5c-spaghetti squash::GFP (Denise Montell); and ubi-E-cadherin::YFP (Denise Montell) (Cai et al., 2014). Generated stocks: act5c-spaghetti squash::GFP; ubi-his2av::mRFP esgGal4, UAS-his2b::CFP, GBE-Su(H)-GFP:nls; ubi-his2av::mRFP esgGAL4, UAS-his2b::CFP, GBE-Su(H)-GFP:nls/CyO; ubi-his2av::mRFP esgGal4, UAS-LifeactGFP; ubi-his2av::mRFP esgGAL4, GBE-Su(H)-GFP:nls; UAS-his2ab::mRFP. Adult female Drosophila 2.5 days post-eclosion were used in all movies except Video 3, which used a female 7 days post-eclosion. Females were collected 0–4 hr post-eclosion, placed in vials with males, and maintained at 25°C. Flies were fed a diet of standard cornmeal molasses food supplemented with yeast paste (1 g/1.4 ml H2O). We designed three types of fly mounts that enable dorsal exposure of the midgut while stabilizing the live intact animal. For upright and inverted microscopes, our design is a modification of a previously published mount for the imaging of adult Drosophila brains (Seelig et al., 2010). To prepare the upright mount (Figure 1—figure supplement 1A–B), a stainless steel shim of 0.001 in thickness (Trinity Brand Industries, 612 H-1) was cut into 19 mm × 13 mm rectangles. From these rectangles, abdomen-sized cutouts were excised either by hand using an 18-gauge PrecisionGlide needle (Becton Dickinson, 305196) or by laser cutting using a micro laser cutting system (see Figure 1—figure supplement 2 for CAD file). In addition, we prepared 60 mm Petri dishes (Fisher, FB0875713A) with a hole 10 mm in diameter drilled into the bottom. Each shim was glued onto the base of a 60 mm petri dish with clear silicone glue (DAP, 00688) and allowed to dry overnight. The mount includes a feeder tube to provide the animal with liquid nutrients during imaging. We found that the feeder tube was essential for prolonged survival of the animal. Feeder tubes were made from 20 µl capillary tubes (Sigma-Aldrich, P0799), which were cut into 38 mm sections. Using a tungsten wire with a small hook bent at the end, a bit of cotton (Fisher Scientific, 22-456-880) was pulled through one end of the capillary tubing to form a feeder wick. Attachment of the feeder tube to the mount is described below. A protective bottom chamber (Figure 1—figure supplement 1A') enclosed the ventral side of the animal during imaging to prevent desiccation. To create the chamber, a 3 mm wide channel was drilled down the wall of a 35 mm Petri dish (Olympus Plastics, 32–103). Kimwipes (4-ply rounds, Fisher Scientific, 06–666) were cut and placed in the bottom of the humidity chamber to be soaked with water before use. The inverted mount (Figure 1—figure supplement 1C) was similar to the upright mount, but used a glass bottomed Petri dish with two 1 mm spacers glued approximately 10 mm apart. Spacers were made from cut pieces of glass microscope slides (63720–05, Electron Microscopy Sciences) and were adhered with silicone glue. The same metal shim was used as with the upright mount, but was not affixed to the dish until the animal was glued and its gut stabilized (see below). Once the animal was prepared, the mounting shim was positioned with animal’s dorsal side toward the glass bottom of the dish and glued to the spacers using KWIK-SIL adhesive silicone glue (World Precision Instruments, 60002). Zeiss light sheet systems require a submersible chamber. To create such a chamber, we used the barrel of a 1 ml syringe in which one end was open to air (Figure 1—figure supplement 1D). A 5 mm x 8 mm square was cut into the side of the syringe barrel, and a metal shim with an abdominal cutout was affixed to the square window using silicone glue. A second window was cut into the opposite side of the barrel to provide physical access for mounting the animal and feeder tube inside. Once the animal and feeder tube were in place, the access window was sealed using a second metal shim and KWIK-SIL glue (World Precision Instruments, 60002). The bottom end of the syringe was sealed with dental wax (Surgident, 50092189) and the barrel was submerged in media in the Zeiss sample chamber. In this manner, the midgut was bathed in media during imaging while the animal’s head and ventral surface remained in an open-air environment. Media for midgut imaging was based on prior recipes for Drosophila organ culture ex vivo (Morris and Spradling, 2011; Zartman et al., 2013). Schneider’s Insect Medium (Sigma-Aldrich, S0146) was supplemented with 5% FBS (Sigma-Aldrich, F4135), 5% fly extract (DGRC) (Currie et al., 1988), 100 µg/mL human insulin (Sigma-Aldrich, I0516) and 0.5% penicillin-streptomycin (Invitrogen, 15140). (Without antibiotics, the imaging media became visibly contaminated after several hours of imaging.) Insulin was added fresh on the day of imaging. Low-melting point agarose was used to stabilize the midgut during imaging. To make the agarose, 2-Hydroxyethylagarose (Sigma-Aldrich, A4018) was mixed with Schneider’s Insect Medium to make a 6% w/v slurry. The slurry was heated to 65°C to melt the agarose, mixed thoroughly and separated into 25 µL aliquots that were stored at 4°C. Prior to imaging, aliquots were heated to 65°C, mixed 1:1 with a 2x concentration of imaging media, and applied to midguts as described below. Where indicated in the text, various fluorescent dyes were added to the imaging media to visualize particular cell structures or conditions. (1) Concanavalin A-Alexa647 (Invitrogen, C21421) was used to stain the basement membrane. A stock solution of 5 mg/mL Concanavalin A in 0.1 M sodium bicarbonate was diluted 1:200 in 1x imaging media to obtain a final working concentration of 25 µg/mL. A drop of this media was placed on the dorsal cuticle prior to cutting the cuticle window. Agarose and subsequently added media did not contain Concanavalin A. (2) SiR-Tubulin (Cytoskeleton, CY-SC002) was used to stain microtubules. SiR-Tubulin was added to 1x imaging media for a final working concentration of 0.5 µM. A drop of this media was placed on the dorsal cuticle prior to cutting the cuticle window. Agarose and subsequently added media did not contain SiR-tubulin. (3) Sytox Green (ThermoFischer, S7020) was used to mark dying cells. A stock solution of 5 mM Sytox Green in dimethyl sulfoxide (DMSO) was diluted 1:5000 in 1x imaging media to a final concentration of 1 µM. Sytox-Green-containing media was placed over the agarose immediately prior to imaging. A narrated tutorial video (Video 1) provides step-by-step instructions for mounting the animal and exposing the midgut. Wings were broken off near the hinge using forceps. Flies were placed in a microfuge tube on ice for at least 1 hr before being glued dorsal side down to the fly mount (Figure 1—figure supplement 1) using KWIK-SIL glue. To optimize access to region R4 of the gut, the fly was tilted toward its left side when glued to the mount. For long-term survival of the animal, its right-side spiracles were kept open (Video 1). After the glue had dried, the feeder tube, filled with 10% sucrose (w/v) in H2O, was secured to the fly mount with dental wax (Surgident, 50092189) and positioned such that the cotton wick was in reach of the animal’s proboscis. The protective bottom chamber was attached to the bottom of the Petri dish with masking tape (Figure 1—figure supplement 1A'). To expose the midgut, a window was cut into the dorsal cuticle as follows. First, a drop of imaging media was placed onto the dorsal cuticle. Next, portions of cuticular segments A1 and A2 were excised using Dumont #55 forceps. In the majority of animals, this excision exposed the looped midgut region R4a-b/P1-2 (Buchon et al., 2013b; Marianes and Spradling, 2013). The loop was gently coaxed using forceps to protrude slightly out of the window. The imaging media was temporarily removed, and a drop of the agarose mixture (described above) was applied to the exposed loop and allowed to solidify. Once the agarose had hardened, a drop of media was added on top of the agarose to avoid desiccation. Between steps, the setup was placed on ice to minimize animal movement. The bottom of a 60 mm Petri dish was used to cover the mounted animal until ready for placement on the microscope. We explored the alternative of cutting a window in the ventral, rather than dorsal, cuticle, but we found a ventral window to be unsuitable for long-term viability. When animals were mounted ventrally, the feeder tube could not be positioned correctly and the spiracles could not be left unoccluded. In addition, the pliable nature of the ventral cuticle often resulted in unpredictable tearing during cutting. An upright Leica SP5 multi-photon confocal microscope and a 20x water immersion objective (Leica HCX APO L 20x NA 1.0) were used to acquire the movies that were analyzed in this study. The microscope was controlled via a Leica CTR6500 controller card on a Z420 (Hewlett Packard) workstation with 16 GB memory and a Xeon CPU E5-1620 (Intel) running Windows 7 Pro and the Leica Application Suite: Advanced Fluorescence (LAS AF, v.2.7.3.9723). In addition, an inverted Leica SP8 confocal microscope with a 20x oil immersion objective (Leica HC PL APO IMM CORR CS2 NA 0.75) and a Zeiss light sheet Z.1 with a 20x water immersion objective (Zeiss light sheet detection optics 20X NA 1.0) were used to test the fly mounts for these microscope setups. For upright and inverted setups, a humidity box was assembled around the lens and the specimen to prevent desiccation (Figure 1—figure supplement 1B). The humidity box was formed from a pipette box lid with a hole for the lens and an inlet tube for humidified air. The box was connected to a 500 ml Pecon humidification bottle containing distilled water, and humidified ambient air was piped into the box via a Pecon CTI-Controller 3700. In addition, for upright setups, the Kimwipes in the protective bottom chamber were saturated with distilled water. 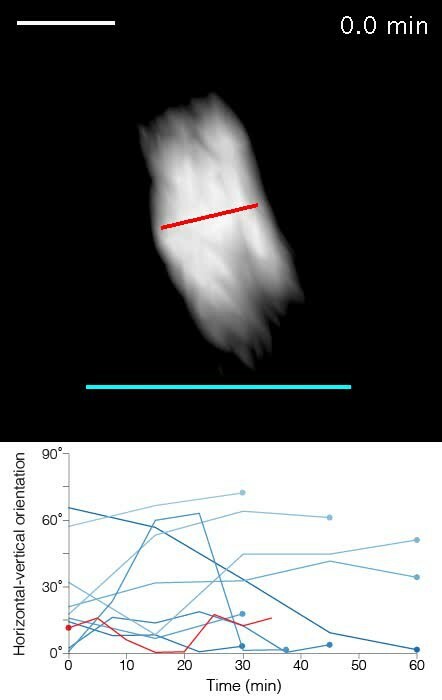 For upright setups, 2–3 ml of imaging media were added to the sample, spanning the distance between the exposed midgut and the water immersion objective. Movies were captured at room temperature (20–23°C). Confocal stacks were acquired with a z-step of 2.98 µm and typically contained ~35 slices. For ex vivo imaging (Figure 1—figure supplement 3A), the upright Leica SP5 multi-photon confocal microscope was used with a 20x oil immersion objective (HC PL APO 20x/IMM N.A. 0.7). To provide a positive control for Sytox Green dead-cell staining (Figure 1—figure supplement 3A), we generated dying midgut cells by dissecting midguts and culturing them ex vivo for 2.5 hr in Schneider’s Medium that contained 1 µM Sytox Green (ThermoFisher, S7020). An 8-well Secure-Seal spacer sticker (ThermoFisher S24737) was used to form ‘wells’ on a microscope slide (Fischer Electronic Microscopy Sciences 63720–05). One midgut and 7 µl of Sytox-containing medium were placed in each well. A coverslip (Fisher Scientific 12-545-81) was placed on top of each well. Midguts were imaged immediately and 2.5 hr after mounting. After acquisition, movies were processed on a Mac Pro computer (OS X 10.8.5) with a 3.2 GHz quad-core Intel Xeon processor and 20 GB memory. LIF files (*.lif) from LAS AF were uploaded into Fiji as a hyperstack for registration. To correct for X-Y drift, movies were converted to RGB files and processed with the Fiji plugin StackReg (Arganda-Carreras et al., 2006a). To correct for global volume movements, movies were processed with the Fiji plugin Correct 3D Drift (Parslow et al., 2014). After registration, movies were evaluated for midgut viability. Viability was deemed to be compromised when any one of the following behaviors were observed: (1) wholesale dimming of fluorescent signals; (2) enterocyte extrusions en masse (>12 cells at once); (3) loss of ordered enterocyte packing; (4) appearance of multiple pyknotic nuclei; or (5) widespread flattening and spreading of progenitor cells. Once any of these criteria were observed, the remainder of the movie was not used for further analysis. For identification of individual cells, intensity thresholding of the ubiquitously expressed nuclear marker ubi-his2av::RFP was used to segment out individual cell nuclei. In fate sensor movies (see Figure 2), intensity thresholding for CFP (stem cells and enteroblasts; esg >his2b::CFP) and GFP (enteroblasts; GBE-Su(H)-GFP:nls) was applied to define masks of nuclei within each channel. Using Fiji’s image calculator function, these masks were used to isolate the His2av::RFP-marked nuclei for individual cell types. Specifically, after registration (Figure 1E), channel masks were generated in Image J to isolate stem cells digitally (CFP channel minus GFP channel), enteroblasts (GFP channel), and mature enterocytes and enteroendocrine cells (RFP channel minus CFP channel). To isolate enterocytes and enteroendocrine cells, whose populations were defined by the absence of esg >his2av::CFP, the His2b::CFP-marked progenitor nuclei were eliminated using the subtraction function in Fiji’s image calculator. Masked nuclei for these three populations were added to the raw hyperstack as unique channels for use in Bitplane Imaris (see below). The two types of mature cells, enterocytes and enteroendocrine cells, were then distinguished by a size filter in Imaris; nuclei ≤ 113 µm3 were classified as enteroendocrine, whereas nuclei > 113 µm3 were classified as enterocyte. To maintain metadata structure for 4D Imaris analysis (see below), final movies were exported to OME-TIFF format (*.ome.tif) using the BioFormats plugin in Fiji. To perform cell tracking, Fiji processed stacks of midgut movies were opened in Bitplane Imaris from OME-TIFF format (*.ome.tif) files. Once converted to an Imaris *.ims file, the 4D volumes were visually inspected using the Surpass module to verify the accuracy of image processing and file conversion. Cell segmentation was then performed by applying the Surface Recognition Wizard module to the masked cell channels generated in Fiji (see above). Final products were visually compared to raw channels to confirm cell-type recognition. Cell surfaces were tracked using the Brownian motion tracking algorithm. Automated Imaris tracking accurately identified ~70–90% of cells, depending on the frequency of organ movements in the movie. Visual inspection was used to correct errors. Once cell recognition was verified for all cells and time points, individual cell statistics were exported as either a Microsoft Excel file or a comma-separated-value file. The data were then imported into Mathematica or MATLAB for quantitative analysis. For Figures 5 and 6 and their associated data, a modification of the above protocol was used. To identify cells that transitioned over time from a stem-like state (GFP:RFP ≤0.17) to an enteroblast state (GFP:RFP >0.17), cells expressing esg >his2b::CFP were identified in Imaris. Their GBE-Su(H)-GFP:nls intensities and nuclear volume were determined at each time point. Cells exhibiting increasing GFP intensities were identified and selected for further analysis. Extruding enterocytes were identified by visual inspection. To measure the dynamics of the E-cadherin::YFP ring (Figure 3B–E), Fiji-processed movies were opened from OME-TIFF files (*.ome.tif) in Bitplane Imaris and viewed as 3D volumes using the Surpass module. Vertices of the E-cadherin::YFP ring that outlined the extruding cell were identified by visual inspection at each movie time point. The Measurement Points tool was used to place a polygon-mode measurement point at each vertex. In addition, a plane representing the basal epithelium was defined by selecting three Measurement Points on the basal epithelial surface underlying the extruding cell. To identify the position of the basal surface, we used either the basement membrane stain Conconavalin-A-Alexa647 or the background fluorescence of the cytoplasm of enterocytes when movies were digitally overexposed. The spatial coordinates of all these measurement points were exported as comma-separated values and imported into MATLAB. To map the ‘footprint’ of the ring in the epithelial plane (Figure 3B), the coordinates of the ring vertices were connected with a line, and the resulting polygon was projected onto the basal plane for each time point. The polygon was color-coded according to its time point in the movie. To calculate the cross-sectional area of the ring (Figure 3C), the centroid of the polygon was triangulated using its vertices. The area of each component triangle was calculated as half of the cross product of the two vectors formed by the centroid and the two adjacent vertices. The area of the ring was calculated as the sum of the areas of each component triangle. Ring areas were calculated for each movie time point. To determine the apical-basal position of the E-cadherin::YFP ring, we calculated the orthogonal distance from the centroid of the ring to the basal plane. This distance was calculated as the dot product of two vectors: the unit normal vector of one of the basal measurement points, and a vector from the centroid to basal measurement point that was used as the origin of the unit normal vector. We defined the duration of nuclear extrusion (Figure 3F) as the length of time that the extruding cell’s nucleus was moving apically. To determine this duration, Fiji-processed movies were opened from OME-TIFF files (*.ome.tif) in Bitplane Imaris and viewed as 3D volumes using the Surpass module. The nuclei of extruded enterocytes were digitally isolated via clipping planes and viewed in cross-section. The nuclei of enterocytes surrounding the extruding cell were used to establish the baseline level of the epithelium. The duration of nuclear extrusion was measured from the time point at which apical movement of the nucleus was first apparent to the time point of maximal apical displacement from the baseline. The centroid of the nucleus was calculated from surface-recognized objects in Imaris. The distance of the nucleus from the basal surface (Figure 3D) was calculated as the orthogonal distance from the centroid of the nucleus to the basal plane, as defined by the basal epithelium reference points described above. Mitoses were identified by visual inspection of maximum intensity z-projections in Fiji and confirmed in Bitplane Imaris using the Surpass module for 3D visualization. To calculate the durations of individual mitoses (Figure 3H), we designated the start point as the initiation of nuclear condensation in the mother cell and the end point as the decondensation of the two sets of daughter chromosomes. To calculate mitotic index, we used nine movies of ubi-his2av::mRFP-expressing midguts that each contained at least one identifiable division. Movies were processed in Fiji, and nuclei were identified and tracked in Imaris as described above. Mitotic index was calculated as TM/TSC, where TM is the sum of the durations of 39 individual mitoses in the 11 movies, and TSC is the sum of the durations of ‘screen time’ for all the stem cells in the same movies. Stem cell ‘screen time’ was calculated as the product of the number of stem cells at t=0 in a particular movie and the duration of that movie. (On occasion, stem cells disappeared or appeared over the course of a movie, but these events were infrequent and are not included in our calculations.) To determine the number of stem cells in a movie at t=0, we used one of two approaches. For midguts that expressed esg >his2av::CFP and GBE-Su(H)-GFP:nls in addition to ubi-his2av::mRFP (2 of 9 movies), stem cells were identified as CFP+ cells with GFP:RFP <0.17 (seeFigure 5), and the number of stem cells was counted following Imaris surface recognition protocols as described above. For midguts in which stem cells were not identifiable through specific markers (7 of 9 movies), the number of stem cells was estimated as 20% of total ubi-his2av::mRFP-expressing cells (de Navascués et al., 2012; O'Brien et al., 2011). To measure the real-time horizontal-vertical orientations of dividing cells (Figure 4A–E), Fiji-processed movies were opened as OME-TIFF files (*.ome.tif) in Bitplane Imaris. For each mitotic cell, the positions of the spindle poles and of the basal epithelial surface were determined at each time point between the start and the end of mitosis (Figure 4—figure supplement 1). Spindle pole positions were inferred from the morphology of the condensed chromosomes and marked using the Measurement Points tool. A plane representing the basal epithelium was defined using the Measurement Points tool to place three points on the basal epithelial surface underlying the spindle. To identify the position of the basal surface, we used either the basement membrane stain Conconavalin-A-Alexa647 or the background fluorescent signal of the cytoplasm of enterocytes made visible when movies were digitally overexposed. The coordinates of the spindle poles and basal planes in 3D space were exported as Excel files and opened in Mathematica. To calculate the spindle angle, we defined two vectors: the ‘spindle pole vector’, which was the difference between the coordinates of the two spindle poles, and the ‘basal plane vector’, which was the cross product of two vectors determined from the three points defining the basal plane. The spindle angle was calculated as the dot product of the spindle pole vector and the basal plane vector. To measure the longitudinal-circumferential orientation of dividing cells (Figure 4F–H), movies were analyzed as maximum-intensity projections in Fiji. Longitudinal and circumferential axes were determined for each mitotic cell by visual inspection, based on the local morphology of the midgut tube and the orientation of the ellipsoid nuclei of the surrounding enterocytes. Division orientation was measured at the time point when we observed decondensation of the daughter chromosomes, an event signifying the end of mitosis. To calculate longitudinal-horizontal orientation, we used the Fiji Angle Tool, which measures an angle defined by two vectors formed from three points. One vector was defined by the difference between the positions of the two daughter cells, and the other vector was defined by the longitudinal axis of the midgut tube. We identified mitoses in which the dividing cell contacted either one enteroblast or two enteroblasts using visual inspection. To determine the spatial coordinates of the mitotic cells and the enteroblasts, Fiji-processed movies were opened as OME-TIFF files (*.ome.tif) in Bitplane Imaris. Nuclei were recognized using the Surface Recognition Wizard. The 3D coordinates of the relevant cells were exported into MATLAB. Division orientations relative to neighboring enteroblasts (Figure 4I–K) were calculated as follows. For mitotic cells contacting one enteroblast, we designated the daughter cell closer to the enteroblast as ‘D1’ and the other daughter cell as ‘D2’. We defined an ‘enteroblast-D1 vector’ as the difference between the coordinates of the enteroblast and D1. We defined a ‘D1-D2 vector’ as the difference between the coordinates of D1 and D2. To calculate the division angle, we computed the dot product of the enteroblast-D1 vector and the D1-D2 vector. For mitotic cells contacting two enteroblasts, we designated the reference enteroblast as the enteroblast whose nucleus was closer to the mother stem cell nucleus prior to division. D1 and D2 daughters were determined relative to that enteroblast following the procedure detailed above. Mitotic cells that contacted enteroblasts were excluded from analyses of horizontal-vertical and planar orientations. Activation of the Notch reporter GBE-Su(H)-GFP:nls was measured in movies of fate sensor midguts (esgGal4, UAS-his2b::CFP, GBE-Su(H)-GFP:nls; ubi-his2av::mRFP) (Figures 5 and 6). As described above, Fiji-processed movies were opened as OME-TIFF files (*.ome.tif) in Bitplane Imaris, and surface recognition was performed to identify individual cell nuclei using the Add New Surfaces function in the Surpass Module. To quantify GBE-Su(H)-GFP:nls activation, we calculated the normalized ratio of GFP:nls and His2av::mRFP intensities as follows. (1) To generate normalized intensity values, raw intensity values for GFP and RFP fluorescence of single cells at each individual time point were determined from cell nuclei. These raw intensities were exported to MATLAB and divided by the maximum intensity in that movie to yield normalized intensities. (2) The ratio of normalized GFP:RFP intensities was calculated for each cell at each time point. The resulting real-time, normalized GFP:RFPs enabled quantitative comparison of GBE-Su(H)-GFP:nls expression between different cells, at different times, or across different movies. To perform the initial analysis of inter-nuclear distances for contacting and non-contacting progenitor pairs (Figure 6—figure supplement 1), we used movies of midguts with genotype esgGal4, UAS-LifeactGFP; ubi-His2av::RFP. For this analysis, two esg+ cells were designated as a pair if they were mutually closer to each other than to any other esg+ cell. Pairs were selected randomly from single time points in four separate movies. Movies were examined in 4D using the Surpass Module in Imaris, and esg+ pairs were identified as either contacting or non-contacting on the basis of their LifeactGFP signal. To determine the inter-nuclear distance of a pair, the (x,y,z) coordinates for the centroid of each nucleus were determined on the basis of surface recognition in Imaris. The distance D between the two centroids was calculated using the equation D = √((x2-x1)2 + (y2-y1)2 + (z2-z1)2). To determine the inter-nuclear distances for sibling pairs with known birth times (Figure 6), we used movies of ‘fate sensor’ midguts (esgGal4, UAS-his2b::CFP, GBE-Su(H)-GFP:nls; ubi-his2av::mRFP). Following a stem cell division, the inter-nuclear distance of the two siblings at each movie time point was calculated as described above. In: RR Beichel, M Sonka, editors. Computer Vision Approaches to Medical Image Analysis. CVAMIA 2006. Lecture Notes in Computer Science, 4241. Berlin, Heidelberg: Springer. pp. 85–95. Lecture Notes in Computer Science pp. 85–95. Current Opinion in Cell Biology 51:103–109. Cell Host & Microbe 5:200–211. Trends in Cell Biology 27:276–283. Trends in Cell Biology 23:185–192. Chaos: An Interdisciplinary Journal of Nonlinear Science 11:227–236. Seminars in Cell & Developmental Biology 67:132–140. Methods in Molecular Biology 1187:101–113. Journal of Cell Science 127:1229–1241. Cell Host & Microbe 20:716–730. The Journal of Membrane Biology 116:177–184. Current Opinion in Cell Biology 43:30–37. Journal of Visualized Experiments e51086. Wiley Interdisciplinary Reviews: Developmental Biology 4:299–309. Thank you for submitting your article "Long-term live imaging of the Drosophila adult midgut reveals real-time dynamics of division, differentiation, and loss" for consideration by eLife. Your article has been reviewed by Sean Morrison as the Senior Editor, a Reviewing Editor, and three reviewers. The reviewers have opted to remain anonymous. The paper details a new live-imaging method for the Drosophila intestine, and delivers several sets of very interesting quantitative data, nicely analyzed, that were collected using this method. The imaging method is a clear advance and has the potential to generate many new insights pertinent to intestinal epithelial homeostasis, if widely applied. Although technically it is not simple, the descriptions provided are sufficiently detailed, especially the excellent movie, to allow other researchers to apply it. The paper is well-written and nicely illustrated – excellent in overall quality. The data that are presented represent a new level of analysis (over standard work using fixed samples), for this interesting stem cell system. The reviewers all recognize that a workable live-imaging platform for the Drosophila midgut represents a significant achievement. The paper only requires at least one example to show that novel insights can be obtained using this approach. The major concern is that none of the three examples put forward by the authors for this purpose were fully convincing due to the small sample sizes and some residual scientific concerns. The revised version of the paper should bring at least one of the examples to completion, by addressing the issues raised in the reviews. Briefly, the point that spindles re-orient multiple times needs to address the concern that these observations might simply be the result of muscular waves going along the gut and not the sort of spindle re-orientation related to ISC biology. The delay in activating Notch signaling in EBs must address the concern that this is caused by the suboptimal conditions of the tissue during the live imaging procedure that is depressing the division rate and does not occur normally. The section on cell extrusion seems particularly promising, but currently several of the interesting observations are apparently based on an N=1. Additional data should be provided. The revised version should also summarize the current limitations of the system and the prospects for further improvements. Martin et al. report the development of a system for live imaging of cells in the Drosophila midgut, a highly responsive tissue maintained by actively dividing intestinal stem cells. 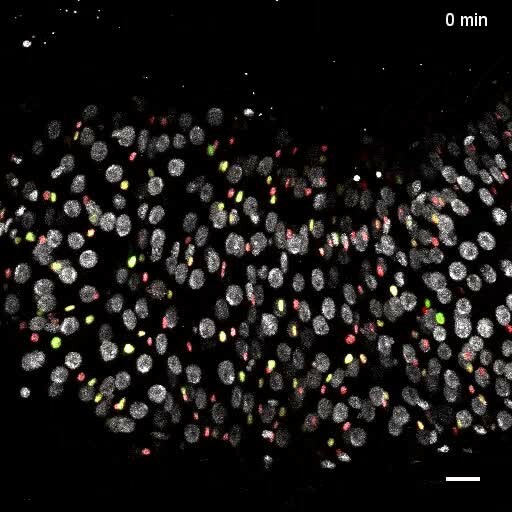 By cleverly employing a series of known techniques for genetically labeling, mounting, image-stabilizing, and 3-D reconstructing data collected from movies over many hours, a new appreciation of midgut cellular dynamics was obtained. This accomplishment is impressive, and the technology for live-imaging Drosophila midguts is very clearly described in the methods and in an excellent instructional movie. The gut is a complex tissue that is known to interact with many if not most other tissues in the animal via enteroendocrine, neural peptide, neural and metabolic effectors. A major concern is the fact that the level of ISC divisions appears to be at least 5-fold reduced during live imaging, compared to their rate in vivo, with at least half of the interpretable movies lacking any cell divisions, despite continued viability and muscular activity. What currently limits imaging to 12-16 hours? This suggests that the picture of midgut activity reported may be more typical of an under-nourished or stressed tissue, than a fully normal one. Despite this caveat, the authors report several interesting observations. Based on a sample size of 39 mitotic events, the ISC mitotic spindle's orientation is seen to re-orient once, or even twice during each division. The results reported seem fairly consistent with previous studies of ISC divisional orientation, with the new dynamic data being consistent with the passage of a wave of muscle contraction that might alter the orientation by changing the positions of larger nearby cells and generating a new mechanical equilibrium. The activation of Notch signaling in newly formed enteroblasts (EBs) is described using a GBE-Su(H) reporter, and in the tissue at steady state. The authors describe a "delay" in the rate of activation of the reporter of 5-6 hours before levels consistent with the enteroblast state are observed. The physiological significance of such a delay is not well discussed by the authors, and the fact that only one daughter cell could be directly observed to EB fate heightened concern that cell production under the current conditions of live imaging are not optimal. The significance of a delay in Notch activation should be more thoroughly discussed. For example, would this result in over-production of Notch target genes that require low levels of receptor activation? The existence of the delay in free ranging animals and its physiological origin should be supported by fixed image data from normal and under-nourished animals from the same genetic background. It would be interesting to compare the delay to the kinetics of loss of Delta staining in these cells, as well. Some of the most interesting results, although not stem cell related, were presented on the mechanics of cell extrusion, based on 34 studied examples. Single enterocytes are expelled by the coordinated action of six neighboring enterocytes in a coordinated process that propels their contents fully into the midgut lumen, and then cleaning seals the former region of contact. This section would benefit from experiments that provide some mechanistic insights into this fascinating process. – EC extrusion happens via the constriction of a pulsatile cadherin ring. – Mitotic stem cells re-orient but if flanked between EBs, they are "anchored in place". – Daughter cells delay Notch activation for many hours after birth. In addition, the authors provide an automated analysis pipeline. Altogether, their new set-up reveals novel findings about the dynamics of tissue renewal and creates potential for many questions to be addressed in the future. Overall, the experiments are very well done, and this will be of broad interest. The single EC extrusion analysis is based on one cell (n=1). The authors mention that 2 other cells have shown similar events but do not show any of these data. It will be important to provide description of at least a few other extrusions. Do they follow the same pulsatile contraction mode or are there many different ways for cell extrusion to occur? The authors mention they see one example of the loss of a diploid cell but do not show whether this happens via the same mechanism? Could they please provide these data or comment on this? They mention that cells can be extruded in groups of 2-5 cells but they do not comment on that further. Could the authors provide more information about this? Is it fundamentally different from the single cell extrusion? An additional video of mitotic cell re-orientation would be helpful. Marianes and Spradling (2013) had described the oriented growth of clones as well as regional boundaries existing in certain subregions of the gut. Therefore, it is possible that the findings presented here regarding a lack of longitudinal-circumferential bias may be region-dependent. The authors might mention this possibility. The authors carefully measured a ratio of GFP/RFP and associated this with active Notch signalling in enteroblasts. Do they expect that this ratio would need to be empirically determined for other labs with different microscopy set-ups and (presumably) if using different RFPs? If so, it would be helpful to explicitly state this somewhere. Chen et al. (2018) have shown that there is another dividing cell type in the lineage that they term "Enteroendocrine Progenitor" cell (EEPs). Some of the dividing cells that were measure could be these precursors. This should be commented on. 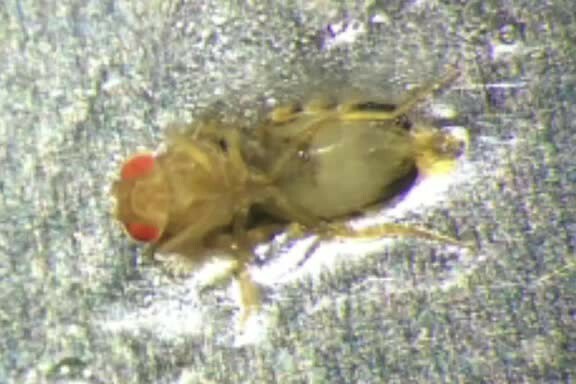 The paper details a new live-imaging method for the Drosophila intestine, and delivers several sets of very interesting quantitative data, nicely analyzed, that were collected using this method. The imaging method is a clear advance and has the potential to generate many new insights pertinent to intestinal epithelial homeostasis, if widely applied. Although technically it is not simple, the descriptions provide are sufficiently detailed to allow other researchers to apply it. The paper is well-written and nicely illustrated – excellent in overall quality. The data that is presented is likewise impressive in quality and represents a new level of analysis (over standard work using fixed samples), for this interesting stem cell system. The biological insights presented at this stage, while not surprising, do advance our understanding of the details of stem cell behavior and epithelial replacement in the fly gut. Overall, I feel this is a valuable unique work, and I support publication. A number of specific comments are listed in the next section – attending to these in review should enhance the usability of the method for other researchers. 1) It would be good to know the level of damage that the imaging setup induces in the fly. For example, does the dissection damage the heart? Is the occlusion of spiracles due to the agarose coating creating oxygenation issues and a hypoxic response in the fly? Are the trachea, being very fine and fragile structures, damaged during the dissection, especially considering that the area of dissection is close to major tracheal trunks? Is there any evidence of melanization or recruitment of adipocytes at the site of dissected cuticle? Please comment on these issues if possible. 2) Similarly, is prolonged imaging damaging the midgut epithelium? A staining with cell viability dyes on guts imaged for several hours could be helpful in this respect. High levels of DNA damage due to imaging may be a contributing factor to the lower than previously described mitotic index. 3) In the subsection “An apparatus for midgut imaging within live Drosophila adults”, it is stated that "Windows cut in the pliable ventral cuticle were unsuitable for long-term viability", although no explanation is given for this. 4) Towards the end of Video 2 the gut movements seem to drastically reduce in intensity. Also, many ECs seem to be extruded at this stage and progenitors increase in motility. Is this due to the animal dying? If so, what would be the best time window for imaging during which the animal is still mostly healthy? 5) In subsection “An apparatus for midgut imaging within live Drosophila adults”, it is stated that imaging at 29°C is not viable, however no explanation is given for the lower animal viability. 6) What is the percentage of movies blurred by animal/midgut movements? How many of said movies can be successfully corrected by software? 7) As for the automatic analysis, how reliably is cell identity assigned by software? 8) Is EC extrusion frequency the same between the first and last half of the movie? 9) In subsection “Enterocyte extrusion: Spatiotemporal dynamics of ring closure, ring travel, and nuclear travel”, it is stated that one instance of diploid cell extrusion was recorded. What was the cell type of said cell? 10) Instead of comparing the mitotic rate between the first and second half of the movie, it would be helpful analyze said parameter hourly, so that eventual stresses towards the end of the imaging session will not be averaged. 11) In the first two time-points of Figure 4C, the red bar seems to indicate the normal to the presumed orientation of the spindle, while in the 30' time-point it seems to be parallel to the direction the cells actually divided. It would therefore be useful to include also the intermediate time-point between the 15' and 30' frame. 12) Could the re-orientation during mitosis simply be due to artifacts due to peristalsis or the movement of neighboring cells? After all, there doesn't seem to be a pattern to these re-orientations discernible from Figure 4E. 13) Is circumferential oriented mitosis happening at a higher frequency (compared to a longitudinal orientation) near midgut region boundaries? 15) If ISC division is influenced by the imaging procedure, how likely is differentiation affected as well in terms of the observed timing of N activation? 16) In Figure 6D we are shown two daughters from a cell whose mitosis was observed. It is quite interesting that upon contact, both cells have a spike in Su(H) expression, but it is the one with the smallest spike that will differentiate as described by its following steady increase in Su(H) expression. During contact, the cell which will maintain its stemness reaches a GFP:RFP ratio well above the threshold previously defined by the authors. Has this behavior been observed more than once during imaging? If so, this would indicate that perhaps some ISC may be mistaken for EB due to transient N activation. It would also be a good indication of bi-directional N signaling between ISC and EB. 17) GFP:RFP plots in Figure 5 show that activation of N signaling may be a slow process. As the authors have focused their attention on the interaction of sibling cells, they have admittedly not being able to follow such interactions to the fullest due to the time required to observe a cell divide prior to the formation of daughters. Could therefore a similar analysis of progenitor cell interactions be performed on neighboring cells (i.e. not necessarily siblings) present since the beginning of the movie? In this manner, interactions could be followed for longer time. 18) As imaging has been performed in young flies (i.e. still undergoing adaptive growth), results may not correctly describe midgut homeostasis for older (> 5 days old) flies. A few tests on more mature flies would be welcome. Briefly, the point that spindles re-orient multiple times needs to address the concern that these observations might simply be the result of muscular waves going along the gut and not the sort of spindle re-orientation related to ISC biology. The delay in activating Notch signaling in EBs must address the concern that this is caused by the suboptimal conditions of the tissue during the live imaging procedure that is depressing the division rate and does not occur normally. The section on cell extrusion seems particularly promising, but currently several of the interesting observations are apparently based on an N =1. Additional data should be provided. We have now examined two of these three phenomena, peristaltic contractions and enterocyte extrusions, in detail. Unfortunately, we were unable to assess the kinetics of Notch activation in intact, unperturbed animals due to technical obstacles (c.f. reviewer 1, fourth point; reviewer 2, eighth point). For peristalsis, we found no temporal correlation between these and mitotic spindle reorientations; this analysis is described below in reviewer 3, twelfth point and is also now cited in the Results section. For extrusion, we extended our original analysis of a single extruding enterocyte to include two additional events; in all three events, we additionally examined instantaneous rates of ring constriction/relaxation (new Figure 3—figure supplement 1). These rate plots exhibit characteristic hallmarks of ratcheting, a finding that is novel and unexpected. Although ratcheting can drive cell deformations in embryonic morphogenesis, it has not been thought to drive cell extrusion in any context. Extrusion-associated ratchets show intriguing differences compared to cell-deforming ratchets in terms of time scale (minutes, not seconds) and subcellular localization (basal, not apical). Importantly, our 4D analyses provide, to our knowledge, the first time-resolved morphometric insights into this essential process for any tissue. We believe the expanded scope and biological interest of the extrusion data fulfill the criteria for completion as described by the Reviewing Editor. A summary of current limitations and prospects for further improvements is now included in the Conclusions. Martin et al. report the development of a system for live imaging of cells in the Drosophila midgut, a highly responsive tissue maintained by actively dividing intestinal stem cells. By cleverly employing a series of known techniques for genetically labeling, mounting, image-stabilizing, and 3-D reconstructing data collected from movies over many hours, a new appreciation of midgut cellular dynamics was obtained. This accomplishment is impressive, and the technology for live-imaging Drosophila midguts is very clearly described in the Materials and methods section and in an excellent instructional movie. We thank the reviewer for these assessments. We agree that the gut is not “fully normal”. Rather, we would argue that our platform is a major advance over ex vivo culture, which is the only other live imaging approach that has been reported to date. Long-term midgut imaging opens the door to many dynamic processes that have previously been unapproachable. The reviewer cites two concerns. The first is why stem cell divisions are less frequent than in vivo, with some movies containing no identifiable divisions. We do not know the reason, but two likely contributors are: (1) The Schneider’s-based media that covers the dorsal window. Potential drawbacks are that (a) the media formulation may not be optimal; (b) the addition of media dilutes circulating factors present in the hemolymph; and/or (c) the media contains pen/strep, which is needed to prevent bacterial contamination but which also eliminates the commensal bacteria that support ‘normal’ rates of division (Buchon et al., 2009). (2) Phototoxicity. Most of the movies in our study used a confocal setup. With confocal, laser light illuminates the entire tissue volume. An imaging setup that exposes the sample to less laser light, such as multi-photon or spinning disk, might help to restore native division rates. We now discuss these issues in the Conclusion. The second concern is why movie durations are limited to 12-16 hours. There are two major reasons: (1) Our shared microscope facility places an upper limit of 16 hours on most imaging sessions, so we have limited experience with movies longer than 16 hours. (2) After 12-16 hours, midguts often acquire one or more features that suggest diminished viability: wholesale dimming of fluorescent signals; enterocyte extrusions en masse (12 cells or more); loss of ordered enterocyte packing; appearance of multiple pyknotic nuclei; widespread flattening and spreading of progenitor cells. We believe that these events may be effects of the imaging media and/or phototoxicity, as described above. During post-acquisition processing, the appearance of any one of these criteria renders subsequent time points unsuitable for analysis. We now discuss these criteria in the Materials and methods section. The idea that muscle contractions could trigger mitotic re-orientation is intriguing. However, for the 10 mitoses in Figure 4E, we found no temporal correlation between muscle contractions and re-orientations during the 15 minutes prior to each re-orientation event. This finding, which has now been added to the Results section indicates either that contractions are not the trigger for re-orientation, or that the effects of muscle contractility are exerted across periods longer than 15 minutes. 1) Is the post-birth delay in Notch activation a native, physiological behavior that also occurs in free-ranging animals, or is it due to sub-optimal imaging conditions and/or nutritional stress? The question is valid. Unfortunately, it is also extremely difficult to address conclusively. Because midgut stem cells divide stochastically and asynchronously, birth times are unpredictable and, in intact animals, can only be estimated by techniques that label mitotic stem cells with a heritable marker. However, current techniques (e.g. FLP/FRT-based clonal labeling) rely on heat shock, which itself induces a stress response that affects division (Strand and Micchelli, 2011) and likely also differentiation (Buchon et al., 2010). To avoid this conundrum, we would need to develop new methodology that rapidly and heritably marks midgut cells at birth without causing stress or other perturbation. This endeavor would require substantial time and effort and have no guarantee of success. Indeed, the technical obstacles of fixed-gut approaches highlight the particular strength of live imaging to reveal dynamic new phenomena. Because of these challenges, we cannot exclude that the imaging protocol itself contributes to the delay. However, we note that kinetics of Notch activation are similar irrespective of whether cells activate Notch at the beginning or end of an imaging session. This similarity suggests that the delay is not due to cumulative stresses of imaging. To address the reviewer’s comment, we now discuss these issues in the text (subsection “Real-time kinetics of enteroblast transitions”; subsection “A delay in Notch activation”). a) Implications of post-birth delay. We speculate that this delay may facilitate the particular ability of midgut stem cells to undergo population-level shifts in symmetric vs asymmetric fate outcomes (O’Brien, Jin Jiang, Jasper, Sokol). A built-in ‘waiting period’ could allow newborn cells to receive and integrate a large variety of intrinsic and extrinsic signals before deciding to differentiate. How such a delay is set in place at molecular and cellular levels—i.e. whether Notch is kept OFF through regulatory events at the plasma membrane, in endosomes, or in the nucleus—will be an important topic for future work. b) Implications of slow rate of Notch activation. Slow activation could signify that a large number of Delta interactions must accumulate before a cell’s level of activated Notch becomes sufficient to reach the enteroblast threshold. Such a stringent requirement might ensure that enteroblasts are generated only when they are truly needed. A second, intriguing notion is that because Notch activation is slow, it can more easily be reversed. In our movies, we observed that nascent enteroblasts occasionally lose expression of GBE-Su(H)-GFP:nls and revert to stem-like status (subsection “Real-time kinetics of enteroblast transitions”). By lengthening the time between when cells become specified as enteroblasts and when they become irreversibly committed, slow activation could provide more chances to ‘backtrack’ if the tissue environment changes. In addition, the reviewer wonders whether slow activation results in prolonged and predominant expression of high-affinity Notch targets. We think this scenario is likely. Perhaps a larger issue is whether the high-affinity targets are also the most important. What is/are the essential target(s) for NICD/CSL in nascent enteroblasts, and what is/are the nature of their CSL binding sites? Bardin et al. (2010) showed that these targets include the E(spl)-C complex. However, not all E(spl) genes are required (Lu et al., 2015); those that are required have not yet been identified; and other, unknown Notch targets are also needed (Bardin et al., 2010; Chen et al., 2018). In general, Notch targets exhibit two types of activation kinetics: graded, dose-dependent expression, or binary, ON/OFF expression. The GBE-Su(H) reporter in our movies, with its synthetic, high-affinity CSL sites (Furriols and Bray, 2001; de Navascues et al., 2012), likely has graded, dose-dependent expression. However, the fact that a sharp threshold of GBE-Su(H)-GFP:nls distinguishes stem cells and enteroblasts (Figure 5C) may hint that one or more essential targets are under binary, ON/OFF control. New Figure 3—figure supplement 1 provides strong evidence that extrusion of enterocytes occurs via a ratcheting mechanism. In the original manuscript, this notion was based on the detailed measurements of closure kinetics for one extrusion (Figure 3A-C). In the revision, we have extended this analysis to two additional, independent extrusions (Figure 3—figure supplement 1B-C). In addition, we have performed new analyses of instantaneous rates of ring closure over time for all three extrusions (Figure 3—figure supplement 1A’-C’). The dynamics of the three ring closures are strikingly similar, consistent with a shared regulatory mechanism. Importantly, recurrent switching between negative rates (constriction) and near-zero/positive rates (stabilization/relaxation) is a hallmark of ratcheting (e.g. Martin et al., 2009; Rauzi et al., 2010). New Video 10 shows an extrusion of an enteroendocrine cell. Enteroendocrine extrusions are ~10x less frequent than enterocyte extrusions, so quantitative analyses were performed solely on enterocytes. These analyses provide, to our knowledge, the first time-resolved morphometric insights into cell extrusion for any tissue in vivo. In particular, our finding that extrusion involves ratcheted constrictions is novel and possibly revealing. Although ratcheting is known to drive cell deformation in embryonic morphogenesis, it has not been thought to drive cell extrusion in any context. Extrusion-associated ratchets exhibit intriguing differences from developmental ratcheting in terms of time scale (minutes, not seconds) and subcellular localization (basal, not apical). Elucidating the molecular regulation of homeostatic cell extrusion and ratcheting is of high interest—but beyond the scope of this study, whose purpose is to report a new technical approach. We are investigating this molecular regulation and hope to report these findings in a future paper. We appreciate the reviewer’s point and have extended our original analysis to include the two additional extrusions, for n=3 total (Figure 3—figure supplement 1). In addition, for all three extrusions we have added new plots that show instantaneous rates of ring constriction/relaxation over time. The frequency switching between negative rates (constriction) and near-zero/positive rates (stabilization/relaxation) is a hallmark of ratcheting (e.g. Martin et al., 2009; Rauzi et al., 2010) and is exhibited by all three extrusions. Indeed, the overall dynamics of the three ring closures are strikingly similar in terms of pulse duration, rates of constriction/stabilization, and total time for closure to complete. These similarities, which are detailed in the revised Results section, are consistent with a common regulatory mechanism. Yes, new Video 10 shows the extrusion of this diploid cell. We believe the cell is enteroendocrine since it is esg—, Su(H)—. We are currently exploring these ‘cluster’ extrusions more closely. Two speculations are that (1) they are triggered by peristaltic contractions, and/or (2) they are a specific response to tissue crowding. An additional video of mitotic cell re-orientation would be helpful. An additional video of mitotic re-orientation is now included (new Video 13). Marianes and Spradling (2013) had described the oriented growth of clones as well as regional boundaries existing in certain subregions of the gut. Therefore, it is possible that the findings presented here regarding a lack of longitudinal-circumferential bias may be region-dependent. The authors might mention this possibility. We thank the reviewer for raising this interesting possibility. In our analysis, all mitoses occurred in the midgut’s R4a-b (P1-2) region, which is the region exposed by the cuticular window. Whether or not circumferential-longitudinal orientation is similar in other regions, or at region boundaries, is an open question. This point is now mentioned in the Results section. G) The authors carefully measured a ratio of GFP/RFP and associated this with active Notch signalling in enteroblasts. Do they expect that this ratio would need to be empirically determined for other labs with different microscopy set-ups and (presumably) if using different RFPs? If so, it would be helpful to explicitly state this somewhere. (GFP:RFP=0.17) is likely specific to our particular equipment and imaging parameters. We now mention this issue and the need for other labs to empirically re-assess the threshold (subsection “A quantitative threshold of Notch activation distinguishes stem cells and enteroblasts”). We appreciate the reviewer’s comment and now discuss the possibility of EEP divisions in the text (subsection “Stem cell division: Mitotic orientation in real time”). Opening the cuticle would reasonably be expected to have some damaging effects. Manual dexterity is an important factor in minimizing this physical damage. When performed as illustrated in the tutorial (Video 1), the heart is not physically touched and the left thoracic spiracles remain unoccluded. We attempted to assess hypoxia using the ODD:GFP reporter (Kim et al., 2018). However, the results were ambiguous. We did not observe expression of ODD:GFP in midguts under our imaging conditions, but we also did not observe expression in positive control midguts subjected to hypoxia. The major tracheal trunks and most secondary/tertiary branches remain intact, although occasional severing of smaller branches can occur (e.g. Video 3). To show the typical integrity of the tracheal network, we have added new Video 2, which shows trachea marked with breathless>GFP. The smaller tracheal branches move in synchrony with peristaltic contractions of the midgut, which indicates that the trachea and the midgut remain intimately associated during imaging. A large branch that is continuous with the smaller branches is visible at the upper right. The large branch does not move during peristalsis because it is not physically associated with the midgut; rather, it is a connector between the midgut-associated branches and a spiracle. We have not observed melanization or recruitment of adipocytes. To gauge midgut cell viability during imaging, we added the cell death stain Sytox Green (Liang et al., 2017; Kolahgar et al., 2015) to the media prior to imaging. We then monitored the number of Sytox+ cells over time. In 3 extended movies, we observed that 2-7% of total cells became Sytox+ over the course of imaging. These data are in new Figure 1—figure supplement 3 and Video 5 and are discussed in the Results section (subsection “An apparatus for midgut imaging within live Drosophila adults”). We expect that the midgut epithelium, like all living tissue, incurs photodamage as a consequence of fluorescence illumination, and it would not be surprising if photodamage contributes to lowered mitotic index. The probability of a mitotic event does not decrease with increased imaging times. Two possible interpretations of this finding are that: (1) pre-mitotic cells are hypersensitive to laser light, so short and long exposures are similarly inhibitory, or alternately that (2) lowered mitotic index is primarily caused by another factor(s). A ventral window was unsuitable for two reasons: (1) Our imaging mount is incompatible with ventrally mounted animals. Specifically, the abdominal area-to-be-imaged must protrude through the cutout in the metal shim and be immersed in media; at the same time, the legs, spiracles, proboscis, and feeder tube must be on the opposite side of the shim, sealed off from the media-containing compartment. When the animal is mounted ventrally, the legs and spiracles cannot be sealed off because they are also on the ventral body. In addition, the feeder tube, which is essential for viability, cannot be properly positioned because the proboscis extends ventrally. (2) The relative softness of the ventral cuticle. Whereas the stiffness of the dorsal cuticle makes it easier to cut a window with clean, precise edges, the pliable nature of the ventral cuticle causes it to stretch and deform as the window is cut, resulting in windows with ragged edges and unpredictable dimensions. We have added a paragraph explaining these points to the Methods (subsection “Animal Preparation”). The reviewer is correct that, the end of Video 3 (originally Video 2) contains an increased frequency of enterocyte extrusions and progenitor motility. This change is particularly evident in the region of the gut tube at the bottom of the frame of view. The reviewer is also correct that the increased frequency of these behaviors is an indicator of tissue stress and decreased viability. In this case, however, viability was lost not because the animal died (the animal was still alive at the end of the imaging session). Rather, we believe that viability was lost because the midgut tube ruptured late in the imaging session. The site of the rupture, which was out of frame (but identifiable in post-imaging dissection), was close to these stress-associated cell behaviors. The reviewer asks about the best time window for acquiring healthy movies. We gauge midgut health using morphological criteria, rather than absolute time, because midgut health varies due to factors such as the exact placement of the cuticular window, animal-to-animal differences in midgut looping, and other, unknown factors. As detailed in the Methods (subsection “Movie registration and cell masking in Fiji”), we consider viability to be compromised when any one of the following behaviors are observed: (1) wholesale dimming of fluorescent signals; (2) enterocyte extrusions en masse (>12 cells at once); (3) loss of ordered enterocyte packing; (4) appearance of multiple pyknotic nuclei; (5) widespread flattening and spreading of progenitor cells. Following appearance of any of these criteria, subsequent timepoints were not used for analysis. We made ~5 attempts to image at 29°C; in all these attempts, the midgut tube ruptured within the first 3 hours of imaging. We believe these ruptures were a consequence of the animals’ heat-induced hyperactivity. Compared to animals at room temperature, animals at 29°C exhibited frequent, vigorous movements, including pronounced extension/compression of their abdomens. We think that these movements caused the midgut tube to be abraded against the sharp edges of the cuticular window, resulting in tube rupture. A brief explanation has now been added to the Results section. Approximately 90% of movies exhibited blurring due to movements of the whole animal or of the midgut itself. Of these, ~70% were successfully corrected using the algorithms described in the Methods (subsection “Movie registration and cell masking in Fiji”). These percentages are now cited in the Results section. With His2av::RFP as a cell marker, Imaris reliably identifies and tracks 70-90% of individual cells. This percentage is now cited in the Materials and methods section (subsection “Cell identification and tracking in Imaris”). Tissue movement is the major reason that some movies have lower rates of accurate identification. Yes, extrusion frequencies are comparable. We examined the timing of 17 enterocyte extrusions in 5 independent movies, each at least 8 hours in length. (One extrusion in Figure 3F occurred in a movie shorter than 8 hours; this movie was not included in this analysis.) Of the 17 extrusions in these 5 movies, 7 occurred in hours 0-4 and 10 occurred in hours 4-8. This result is now stated in the text (subsection “Enterocyte extrusion: Spatiotemporal dynamics of ring closure, ring travel, and nuclear travel”). The diploid cell was enteroendocrine (negative for expression of esg>his2b::CFP). A video of this extrusion has now been added (new Video 10). As requested, we have now calculated the hourly mitotic index for each of imaging hours 1-14 (Author response image 1). These calculations used 35 mitoses that occurred in 8 independent movies. 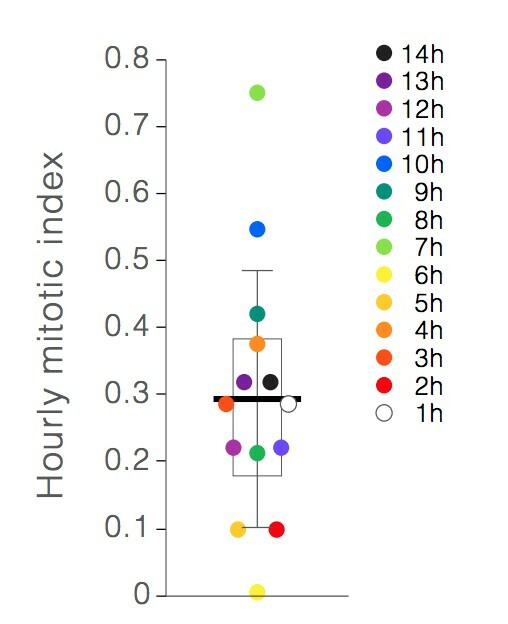 Similar to the formula for overall mitotic index (Materials and methods, subsection “Spatiotemporal analyses of stem cell mitoses”), the hourly mitotic index was calculated as TM(h)/TSC(h), where h is the hour of imaging (h=0 to 14), TM(h) is the sum of the durations of all individual mitoses that occurred during hour h for each of the 8 movies, and TSC(h) is the sum of’ screen time’ of all individual stem cells during each hour of imaging for the same 8 movies. The number of individual stem cells in each movie was set as the number of individual stem cells at t=0; this number was determined as previously described in the Materials and methods (aforementioned subsection). Individual points show the mitotic index for hours 1-14 of live imaging. Earlier hours are denoted by lighter colors, and later hours are denoted by darker colors. Box shows the mean of the hourly indices (bar) and the first and third quartiles (0.18% and 0.38%). Whiskers show the standard deviation (0.19%). No correlation between mitotic index and imaging hour is observed. As expected, the average of the 14 hourly mitotic indices (0.29% +/- 0.19%) was near-identical to the overall mitotic index reported in the original submission (0.28%). Half of the hourly mitotic indices (7/14 indices) clustered within a range of 0.21-0.31%. The other half fell outside this range, with individual values varying from 0.00% to 0.71%. We found no drift in mitotic index over time nor any discernible pattern in the timing of mitotic events. 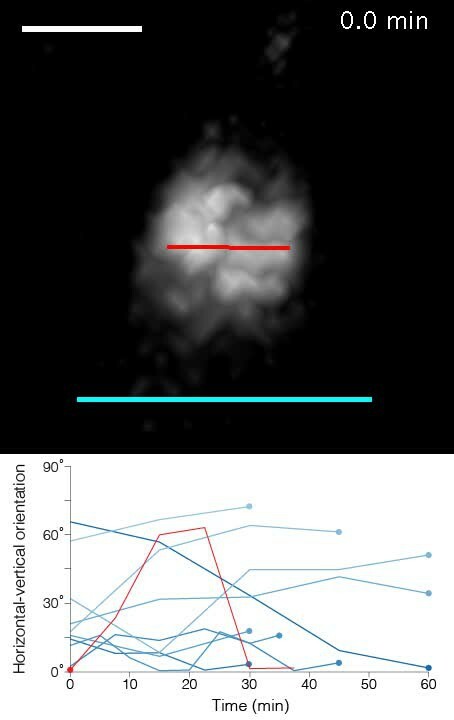 This finding suggests that mitotic rate is not principally determined by the cumulative stresses of imaging, but rather by factors that are already present at the start of imaging and/or that happen stochastically. We apologize for the ambiguity. In all three panels of Figure 4D (originally Figure 4C), the red bar is parallel to the presumed orientation of the spindle. To clarify, we have added a cartoon schematic of the mitotic cell below each panel. The cause(s) of mitotic re-orientations is an intriguing topic. Peristalsis does not appear to be the immediate trigger, as we found no temporal correlation between peristaltic contraction and re-orientation for the 10 mitoses in Figure 4E. (This finding is now discussed in subsection “Stem cell division: Mitotic orientation in real time”.) Neighbor cell movements are another potential contributor. We will quantitatively analyze neighbor movements, as well as other stem cell-extrinsic and -intrinsic factors, in future work. The question is pertinent. As shown by Marianes and Spradling (2013), stem cell clones do not cross most region boundaries; one possible mechanism could involve circumferential orientation of boundary-localized divisions. Unfortunately, our current movies do not allow us to assess this interesting possibility. Because of animal-to-animal variation in midgut looping and placement of the cuticular window, the P1-2 boundary is not consistently exposed. Even when it is exposed, this particular boundary is hard to pinpoint because it lacks a pronounced muscle constriction. It would be precarious to try to identify the boundary-localized divisions, which are just a small fraction of all divisions, without live, region-specific markers. Rather, we have now added discussion of the possibility that boundary-localized divisions could be a special, circumferentially biased type of division (subsection “Stem cell division: Mitotic orientation in real time”). The possibility that neighbor cells somehow influence or even control mitotic reorientations is highly intriguing. Clearly, rearrangements of the mitotic axis are different when a stem cell has two neighboring enteroblasts (Figure 4I-K). The two enteroblasts serve to constrain the stem cell spindle to the enteroblast-enteroblast axis. We don’t know the mechanism for this stabilization, but we speculate that it may involve engagement of cell-cell adhesion receptors at stem cell-enteroblast interfaces and linkage of these receptors’ intracellular domains to astral microtubules. Mitotic stem cells with exactly one enteroblast do not appear stabilized, perhaps because the spindle in this arrangement can pivot around its sole enteroblast ‘anchor’. We have not examined whether re-orientations are different when stem cells have one neighbor enteroblast compared to when they have neighbor enterocytes exclusively, or whether any such differences are due to enteroblast motility or spatial packing. The question is a valid one. We now discuss the possibility of such imaging-associated effects in the Results (subsection “Real-time kinetics of enteroblast transitions”; subsection “A delay in Notch activation?”). Although these effects cannot be excluded, we note that kinetics of Notch activation are similar irrespective of whether cells activate Notch at the beginning or end of an imaging session. This similarity suggests that any such effects would be due not to cumulative stresses of imaging, but rather to factors that were already present at the start of imaging and/or that occurred stochastically. We apologize that our description of the data was unclear. In Figure 6D, the spikes of GFP:RFP from t=2.6-3.5 h (Cell 1) and t=1.5-3.6 h (Cell 2) are artifacts. These artifacts were caused when a third, non-sibling cell collided with the two siblings (Video 18). This third cell was a mature enteroblast with an extremely bright GBE-Su(H)-GFP:nls signal. During the collision, when the cells were in intimate proximity, the bright GFP of the mature enteroblast ‘bled into’ the Imaris-recognized surfaces of the two siblings. The points in the Figure 6D graph show all GFP:RFP measurements, including those that were artifactually elevated by the collision. To better distinguish which measurements are artifactual, we have now made two modifications: (1) Gray, instead of black, points denote GFP:RFP measurements during the collision. (2) The interpolated lines now contain gaps when the collisions occur. In addition, we have added explanatory text to the Results section (subsection “Contacts between newborn siblings are variable and dynamic”) and improved the Figure 6D legend to describe this artifact more clearly. Although the spikes in Figure 6D were artifactual, we did observe other instances of spiking that were endogenous. Figure 6B is one such example. The values of these spikes were consistently below the 0.17 enteroblast threshold, so they would not have caused stem cells to be misidentified as enteroblasts. We did not observe temporally correlated spikes between sibling cells; however, GBE-Su(H) may not be optimal for reporting possible bi-directional signaling. We thank the reviewer for this suggestion. Using the criteria for cell-cell contact from Figure 6—figure supplement 1A-B, we have now evaluated the four enteroblast-transitioning cells in Figure 5D-E. Strikingly, all four of these cells are in likely contact with stem cells immediately before they start to transition. Further, these contacts persist during much of the cells’ transition periods (gray background shading in graphs in Figure 5D-E). This correlation is consistent with the notion that prolonged contact with a stem cell—possibly, but not necessarily, the mother stem cell—may be required and/or sufficient for cells to transition to an enteroblast state. Explicit investigation of this scenario will be an attractive focus for future work. We are excited that our imaging methodology enables the comparison of real-time cell dynamics during homeostasis and growth. Such work is currently in progress, and we plan on reporting these results in a separate study. ENS was supported by NSF GRFP DGE-1656518 and by a Stanford Developmental Biology and Genetics NIH Training Grant (2T32GM00779038). PMR was supported by a Stanford Bio-X Bowes Graduate Fellowship and by a Stanford DARE (Diversifying Academia Recruiting Excellence) Fellowship. XD was supported by NRSA 1F32GM115065 and by a Stanford Dean's Postdoctoral Fellowship. LAKJ was supported by 1F31GM123736-01 and by a Stanford Developmental Biology and Genetics NIH Training Grant (2T32GM00779038). This work was supported by the National Institutes of Health (NIH) (R01GM116000-01A1), the Stanford Discovery Fund Innovation Program, and a Center for Biomedical Imaging at Stanford Seed Grant to LEO. Confocal microscopy was performed at the Stanford Beckman Cell Sciences Imaging Facility (NIH 1S10OD01058001A1). Fly extract was obtained from the Drosophila Genomics Resource Center (NIH 2P40OD010949). We thank B Bolival for the construction of the fate sensor stocks; B Ohlstein, Y Inoue, D Montell, J de Navascués, and the Bloomington Drosophila Stock Center (NIH P40OD018537) for other Drosophila stocks; T Larsen and B Pruitt for assistance with and use of a micro laser cutter; M Goodman and T Blankenship for helpful discussions; and C Cabernard, A Bardin, J de Navascués, S Brantley and A Sherlekar for valuable comments on the manuscript. © 2018, Martin et al.